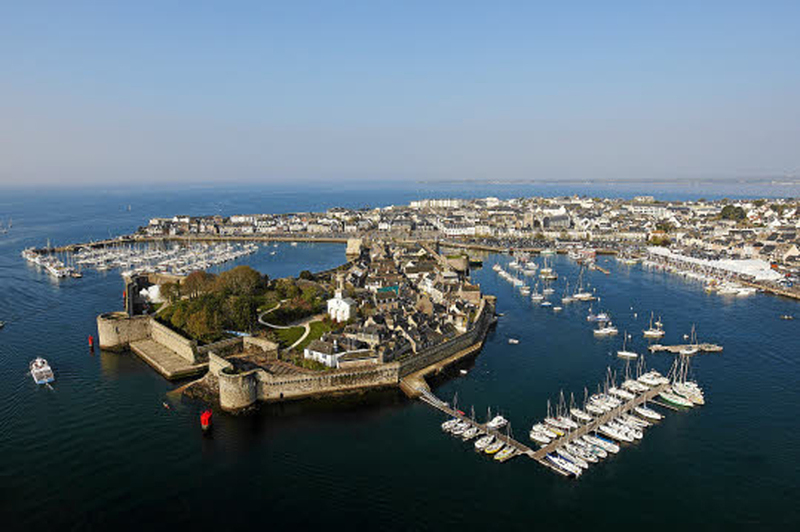 Wednesday, March 23: This morning I’m writing from a large ferry crossing the English Channel, taking me from Roscoff in Brittany to Plymouth England. There’s no wi-fi on the ship so you’ll read this after I’ve arrived in the U.K. but I want to write while yesterday is fresh in my mind. My drive was south to north, across the height of Brittany. The land through which I drove was lovely – rolling green hills, a few fat cows in the fields, a two lane road passing through many small villages and towns that were well decorated with daffodils. At one point I had a distant view of the great bay that divides western Brittany just before I exited the highway. 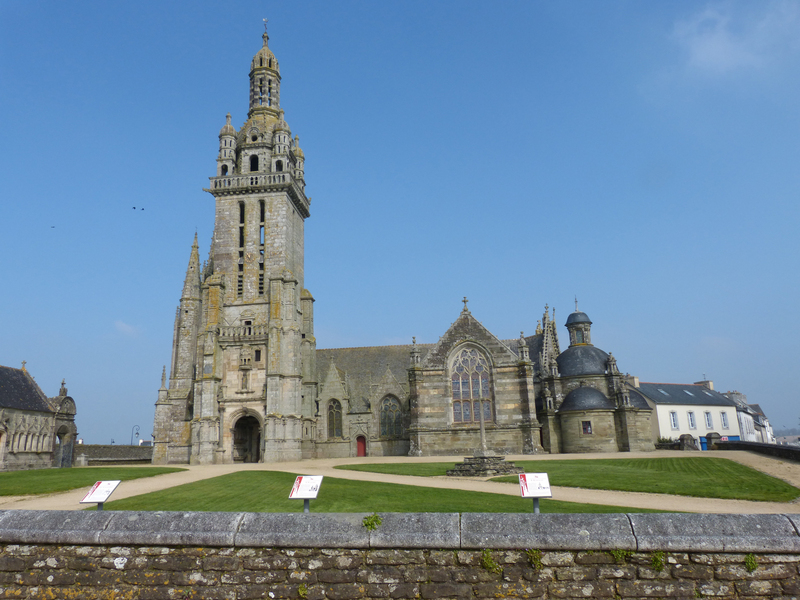 My goal was the town of Roscoff, located almost on the most northerly point of Brittany. It’s the home port for three ferry companies that take people and freight from France to England, Ireland, and Spain. It’s been a fishing port for centuries; Breton fishermen historically have sailed to the waters off the coast of Canada’s maritime provinces, returning after months with a hold filled with cod. Today a few people still earn their living by fishing. I saw one fisherman selling his catch to people crowding around on the pier. 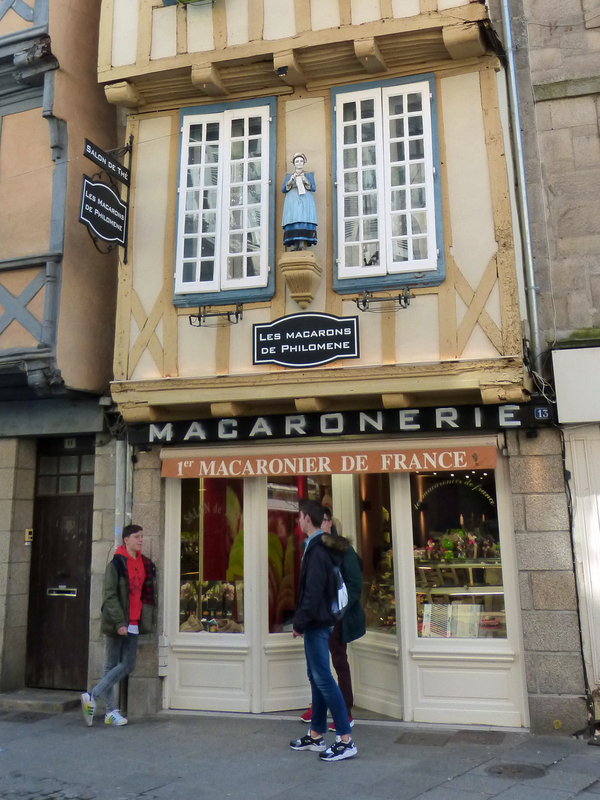 The town of Roscoff, like most towns in France, is many centuries old. 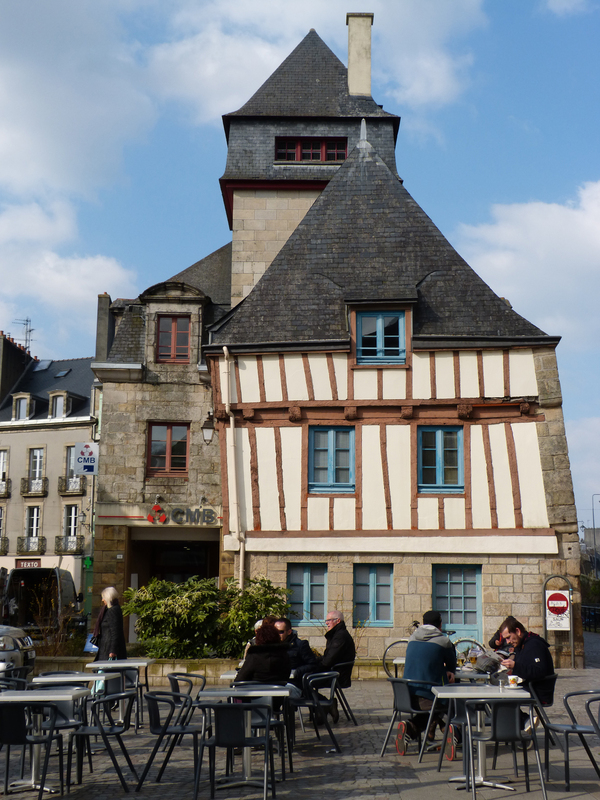 Unlike all the other towns I’ve toured in Brittany there were no half-timbered buildings here. Instead the streets are filled with stone buildings, many of them constructed in the 16th and 17th centuries. This town is charming, interesting and well-worth visiting. 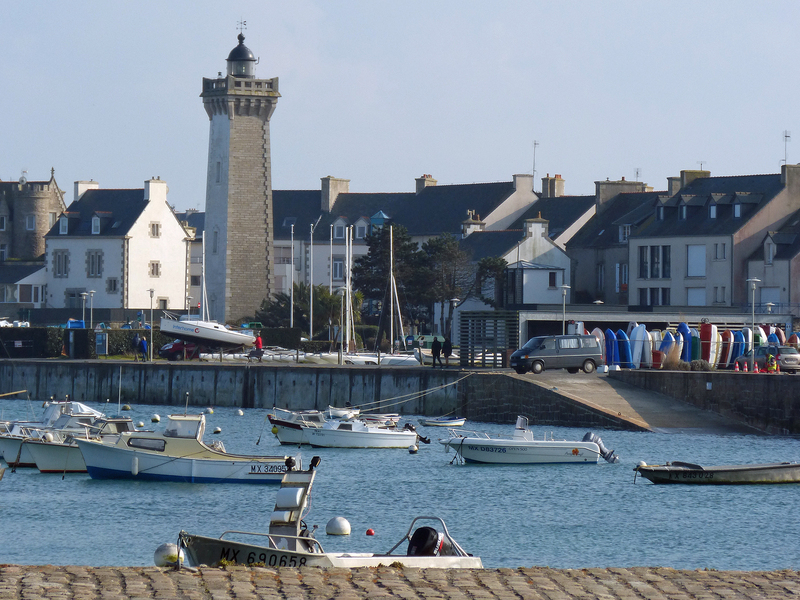 If you find yourself in Brittany, make a point of coming to Roscoff, even if you don’t plan to take a ride on a ferry! Thursday, March 24: Now I am in a small, ancient city called Totnes in Devon, a county in southwestern England. My AirBnB accommodation is a small suite (bedroom, bath, kitchette) in the home of Denise who has been very welcoming to me. After picking me up at the train station yesterday Denise made me a cup of tea and we enjoyed a getting-to-know-you chat. Then she invited me to join her and some friends at a film showing in a barn that’s been made into a cinema. Before the film we had dinner in an inn just up the country road from Denise’s house – an inn that proclaims its roots dating to the early 1300’s. More on that in my next post. The main thoroughfare with Sunday shoppers. 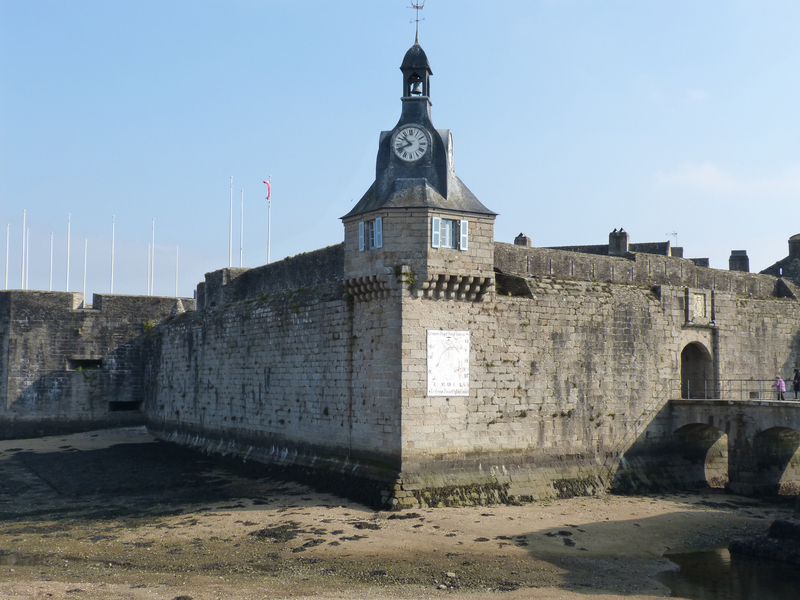 Today I drove a few miles from Quimper to a seacoast town that has one rather extraordinary feature: in the middle of the harbor on what must be a man-made island there’s an ancient fortress that’s been turned into a tourist attraction. In the 17th century the famous architect of France’s fortresses, Vauban, created what is now called the “ville clos” (enclosed town). Important for securing the western part of France from the English when it was built, today it’s a well-regulated and attractive place to visit. (I didn’t see even one T-shirt for sale!) Here are a few pictures I took today. An aerial view of the town showing the fortress. This picture is borrowed from the city’s website. I hope they won’t mind. Approaching the “ville clos” in low tide. There were a number of clever and attractive signs. 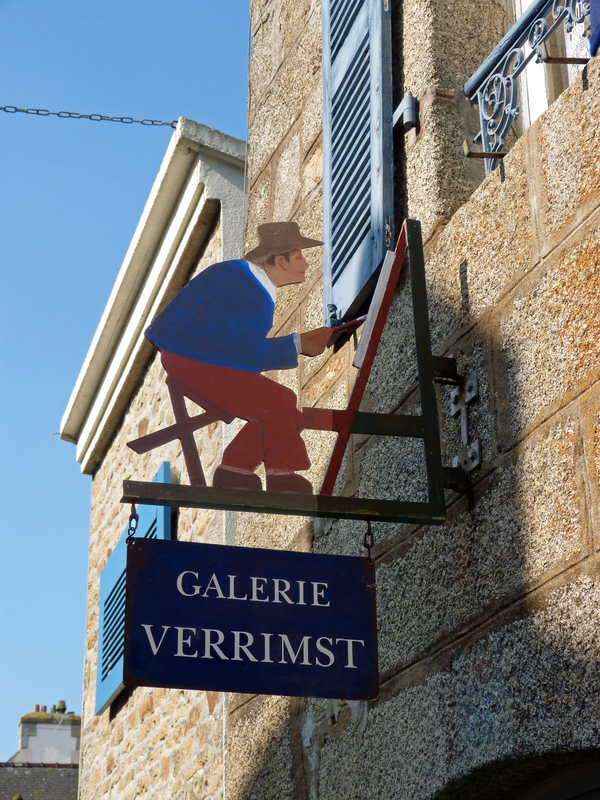 I thought this one of an artist at his easel outside a gallery was the best. I’m not quite sure what these “bunnies” were doing — we didn’t communicate well! But they were cute! There is a wide range of old buildings on the site, including a church, a museum, and some attractive homes as well as shops. 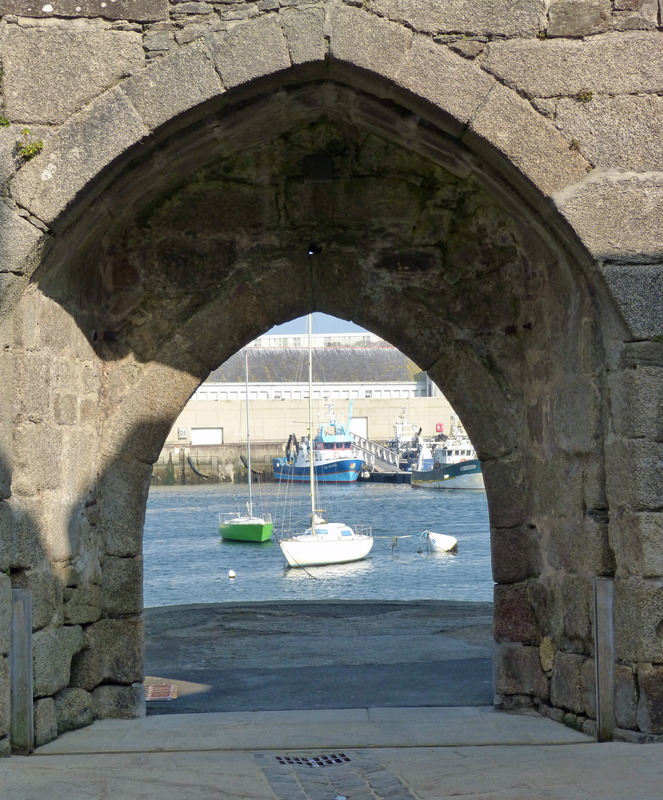 A “peep hole” in the walls enabled a view of the fishing fleet and provided stairs down to the surrounding land in low tide. 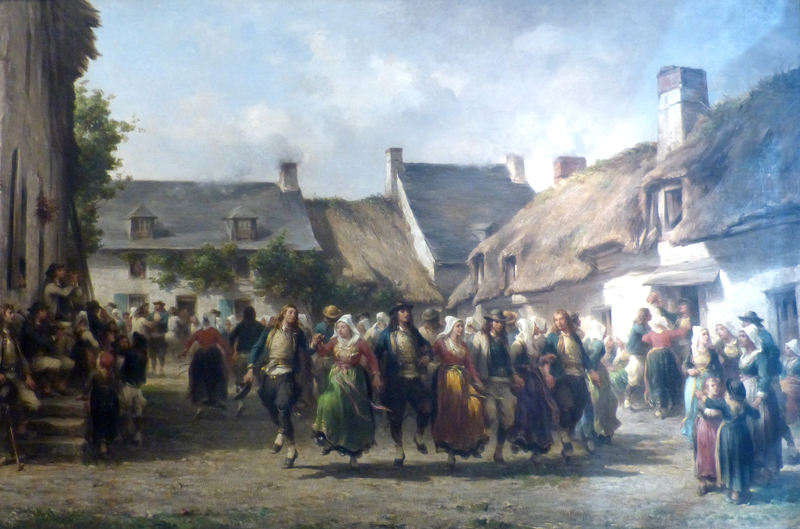 L’Arrivée du Pardon de Sainte-Anne de Fouesnant à Concarneau. 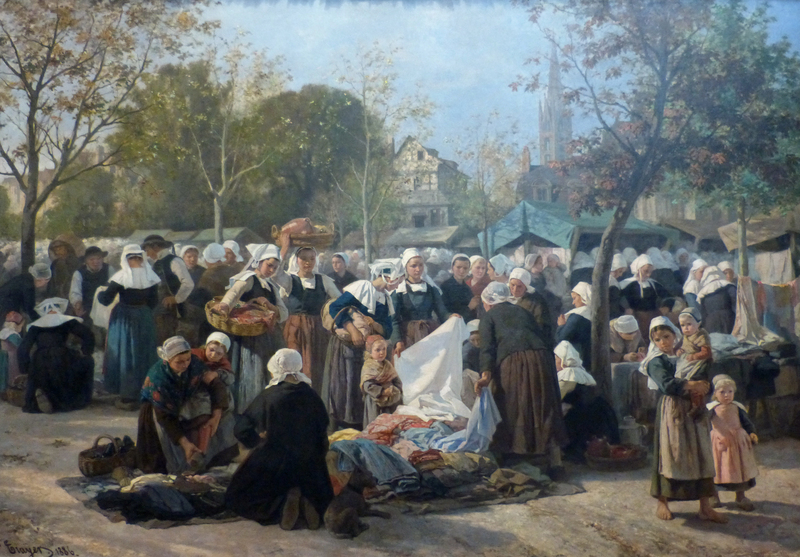 by Alfred Guillou, 1887. 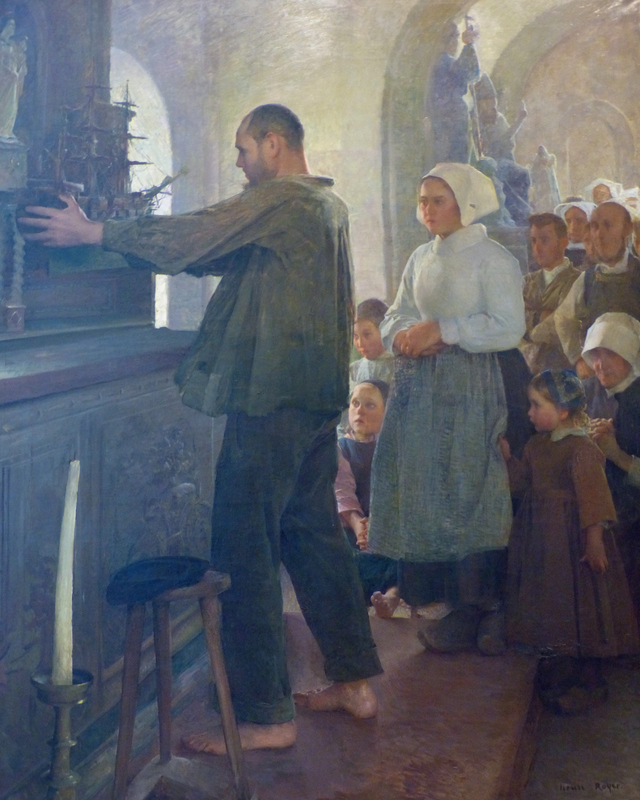 In France the term “pardon” is used for religious ceremonies when icons from the church are paraded to celebrate the saint’s day or another important occasion. 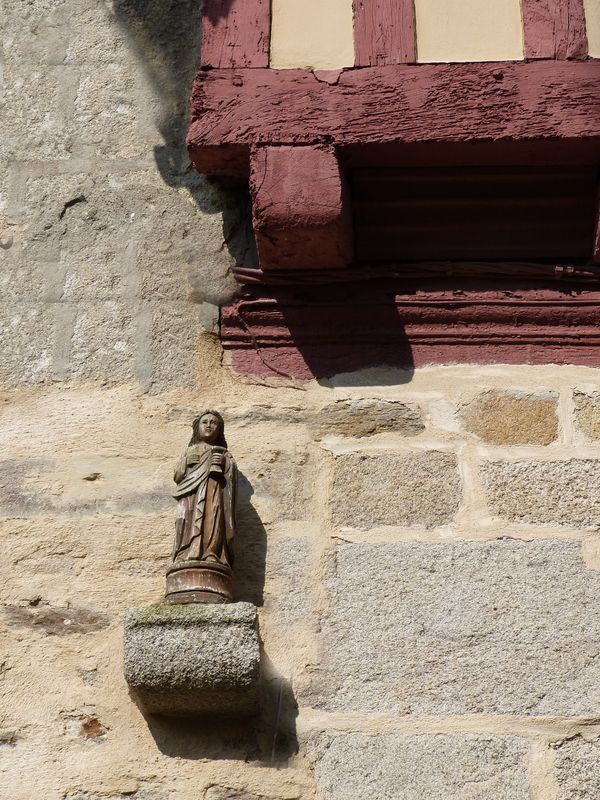 Usually these involve men carrying heavy icons through the streets but in Brittany apparently it was common to bring the saints in by small boats. 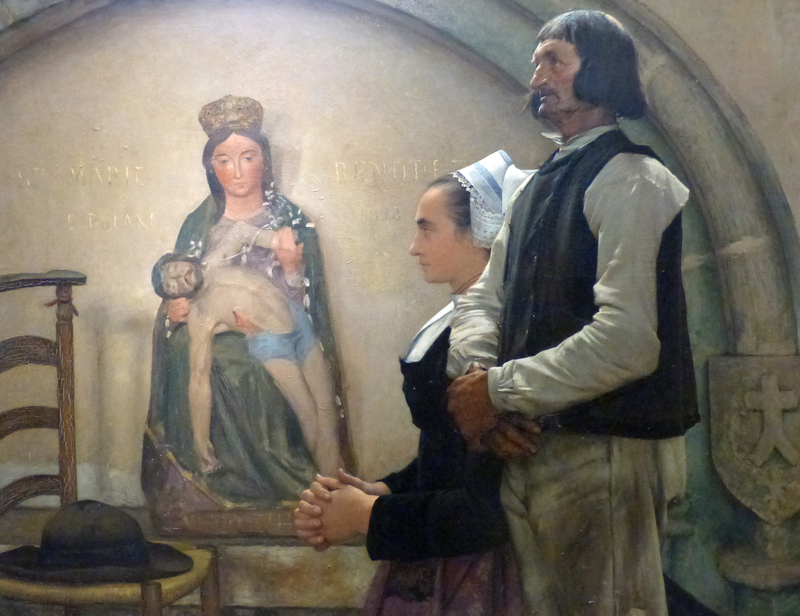 Translating the sign posted by the painting entitled “The Arrival of the Pardon of Sainte-Anne” (above): “The pardon is one of the manifestations of the faith in Brittany. 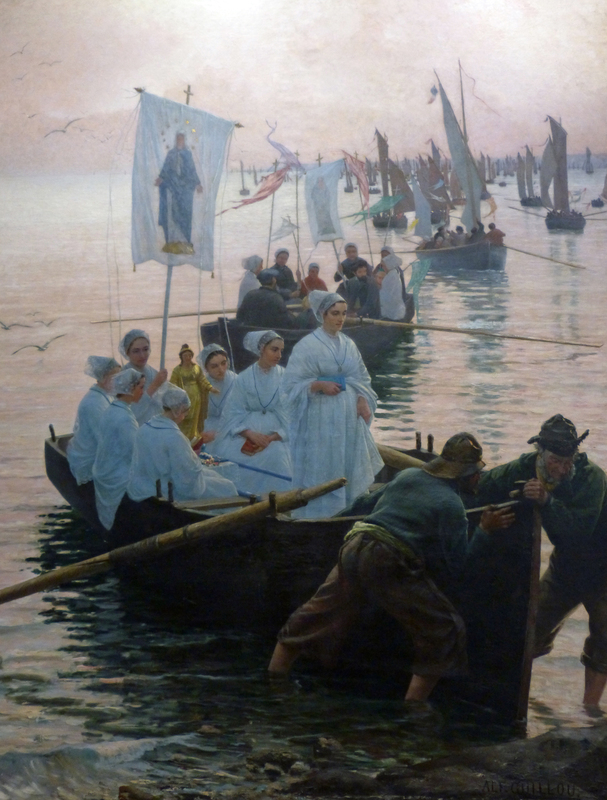 In holiday dress, carrying banners and statues men, women and children return by land and sea [the statue of Saint Anne of Fouesnant] to the sanctuary.” Saint Anne is the patron saint of sailors. The next image is similar. Here are a few others I really like. 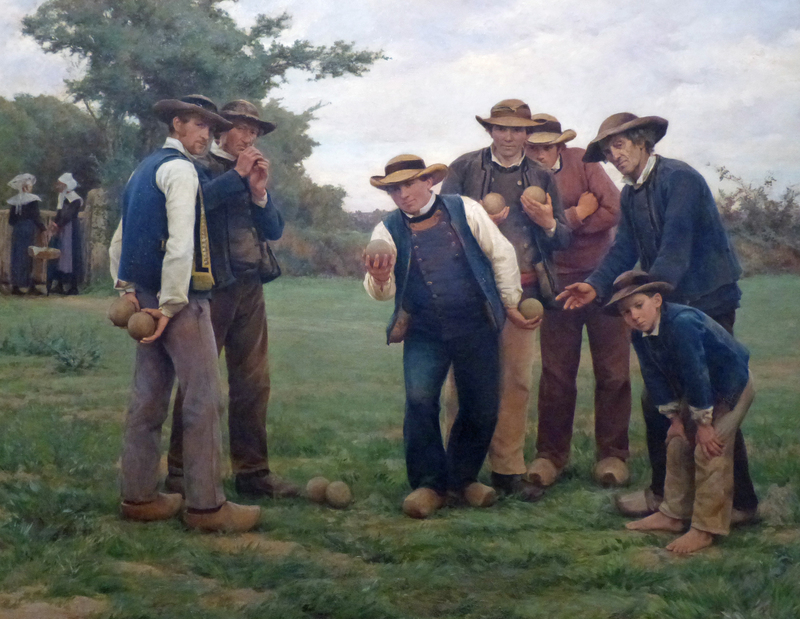 And the men gather for sport — in this case, “boules” or “petanque” which is similar to bowling. Théophile Desrolles: Les Joueurs des Boules (The Boules Players), no date. 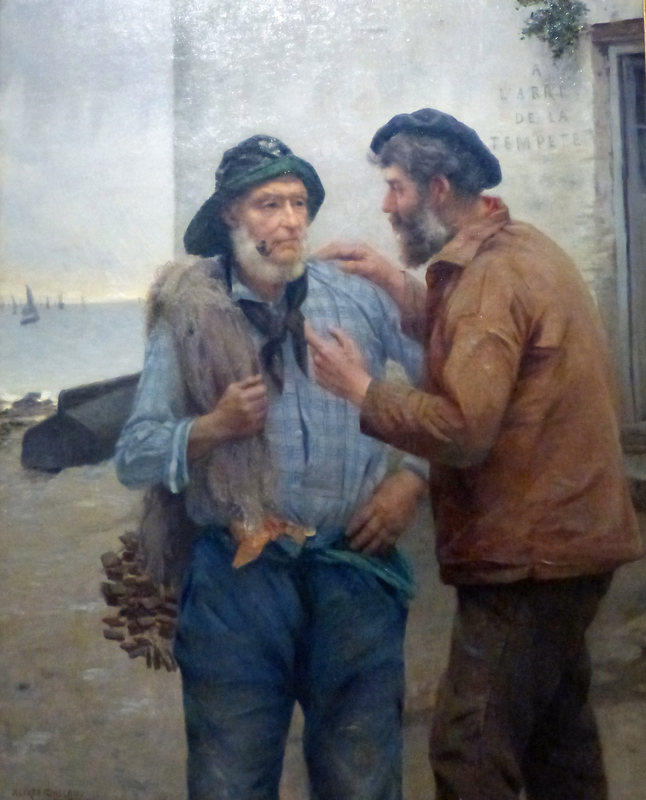 A couple of old sailors engaged in conversation. 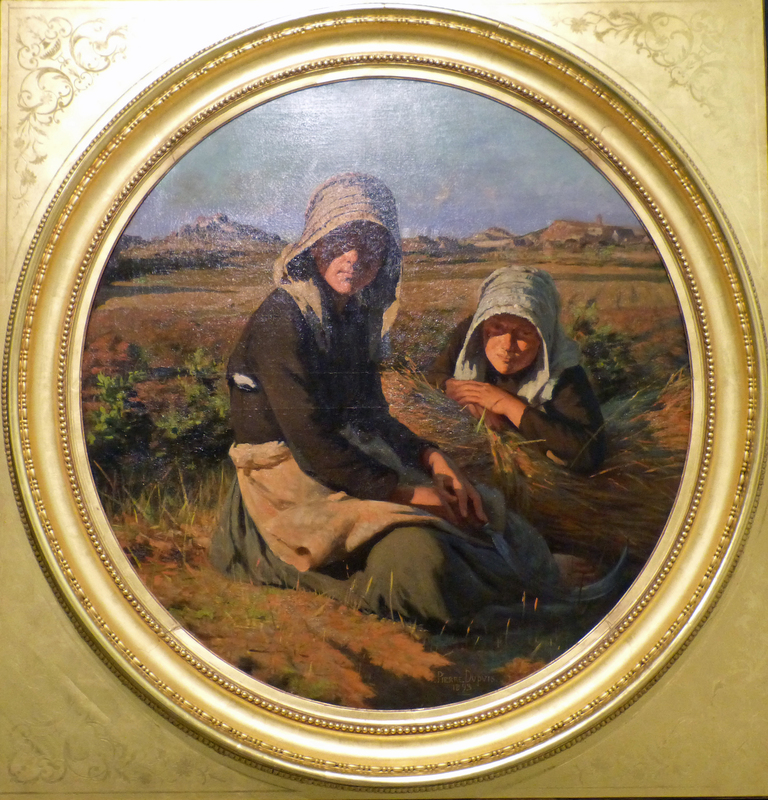 Alfred Guillou, A la Abri de la Tempête (Taking shelter from the storm), about 1890. “Slow Travel” is a phrase that been coined to refer to people who travel like I do: rent an apartment or cottage, stay in one place for several days, a week or longer, take tons of pictures (not required), and have time to really see the place and the people around you. 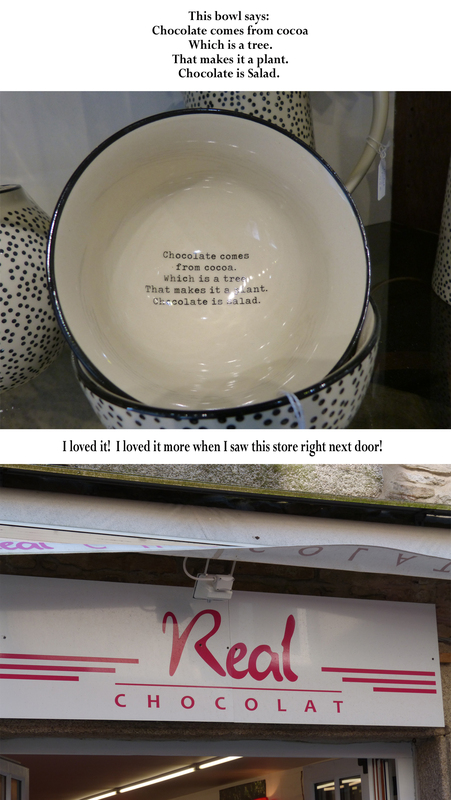 Today I came across lots of interesting things I’ve missed before. Here are some of them. 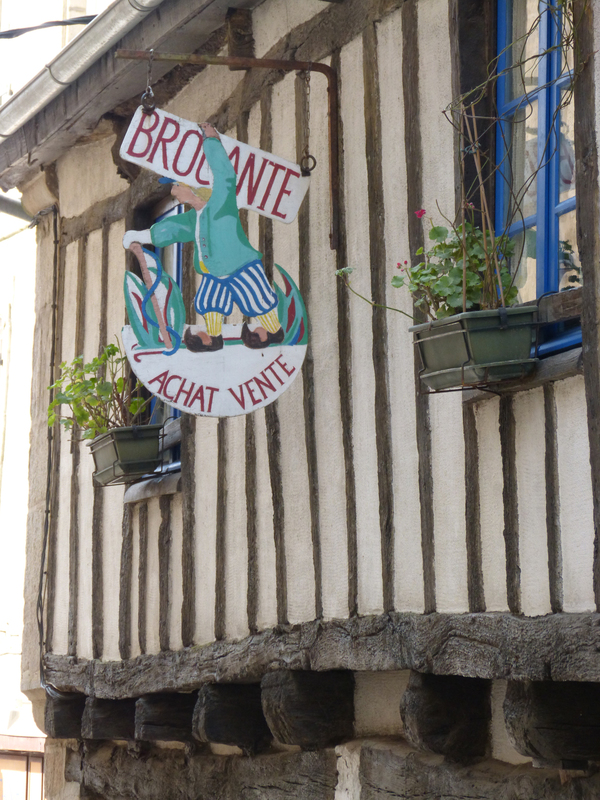 “Brocante” means antique things belonging to ordinary people, bought and sold. 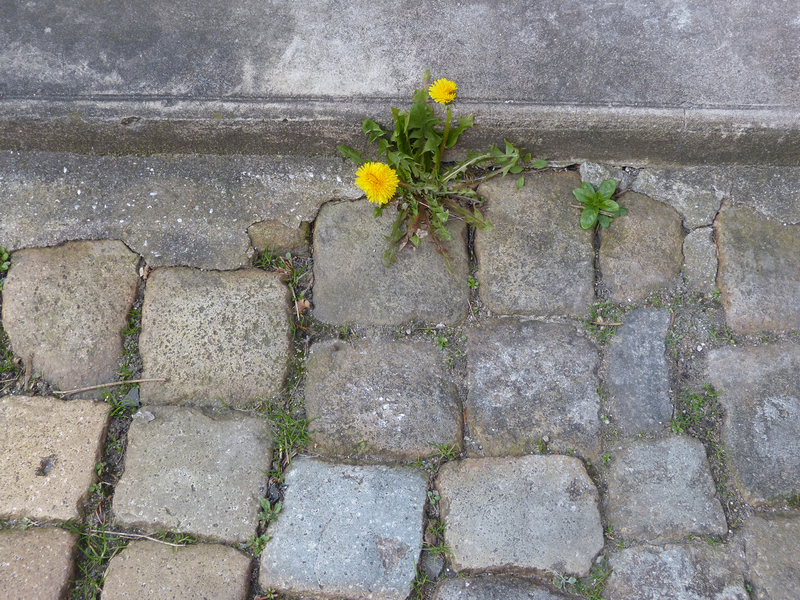 Alley of Cooked Bread — probably the site of the community oven. Happy St. Patrick’s Day! Happy Spring! 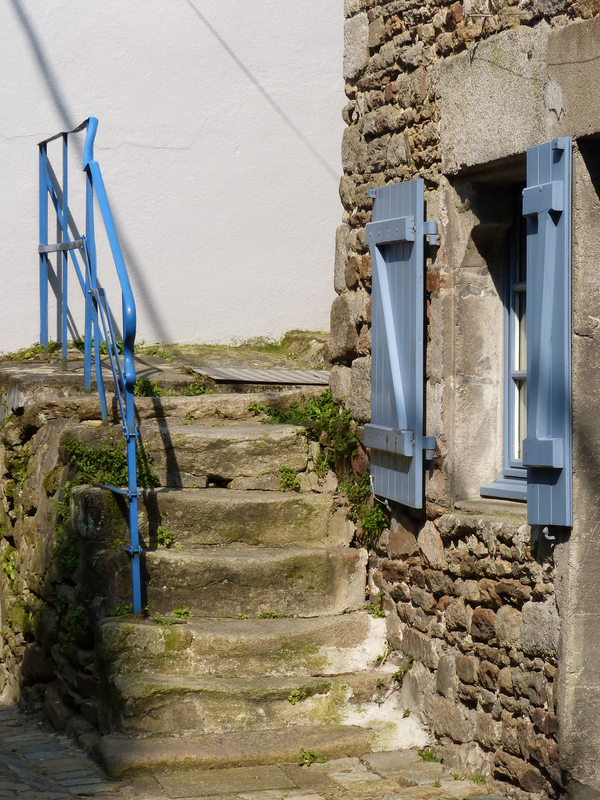 A half-mile walk along the river from the tourist office in Quimper took me to a tiny and very old (pre-Roman) settlement called Locmaria. It is known for two things: a church built ca. 1000 A.D. and the creation and production of the whimsical pottery known as “Quimper Faience.” Unfortunately, both the faience museum and the church were closed. I’ve found no information about this building but it’s very likely that only the main, barn-like large part is a thousand years old. The tower and the appendage on the front as well as the porch and window on the front were probably added much later. 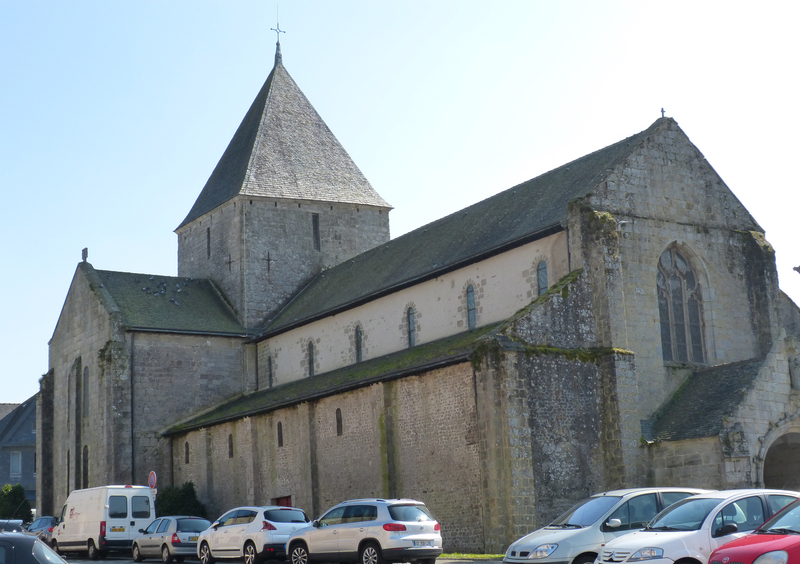 The church pre-dates gothic architecture so it’s what is known as “Romanesque” style. That’s a building with a high interior supported by lower appendages (aisles) on the sides. The walls are made of thick stone as are the pillars that support the roof. Windows are small and high – little light makes its way into these churches. This is a design that is found in the oldest existing churches in Europe and that remained popular for parish churches into the 15th or 16th century and beyond. It’s a shape that remains very popular still for barns in both Europe and America. Parts of the church I believe were added in the 17th century include the bell tower, the altar, the “chevet” (the French word for the rounded part shown here on the right). This church became a priory (monastery) church in the mid-1600s and some changes were made in that era. In all likelihood both the transepts and the tower were added then as was a renaissance porch at the entrance with a gothic window above it. A large priory building bearing the date 1664 was constructed adjacent to the church, and a cloister was added. 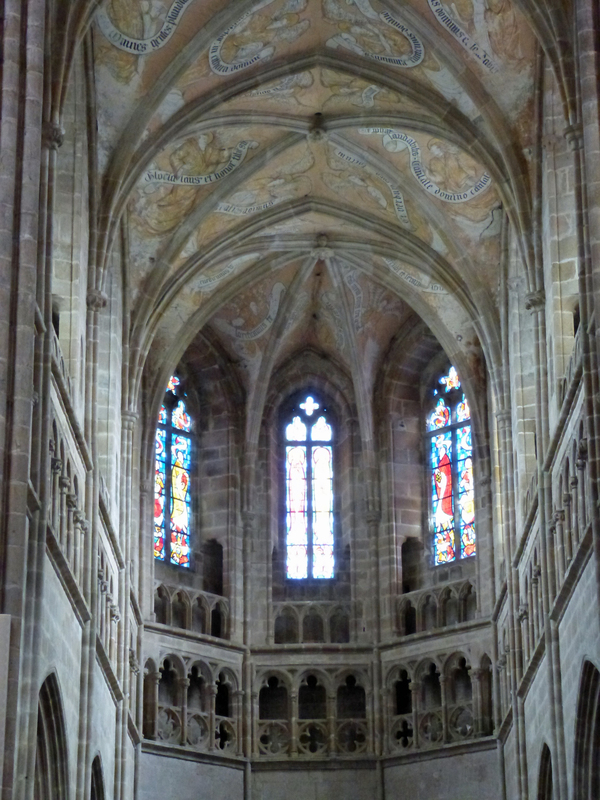 The interior of the nave remains much in the original state. 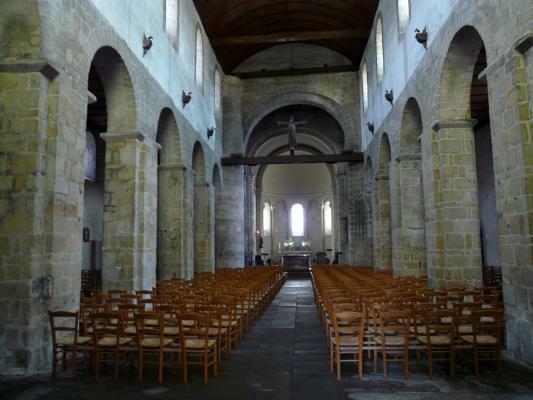 This photo of the interior (found on the web) shows the original nave with its Romaneque rounded arches, thick columns and high windows and the wooden ceiling. There’s a pretty, medieval-style garden near the church. Daffodils were in bloom! 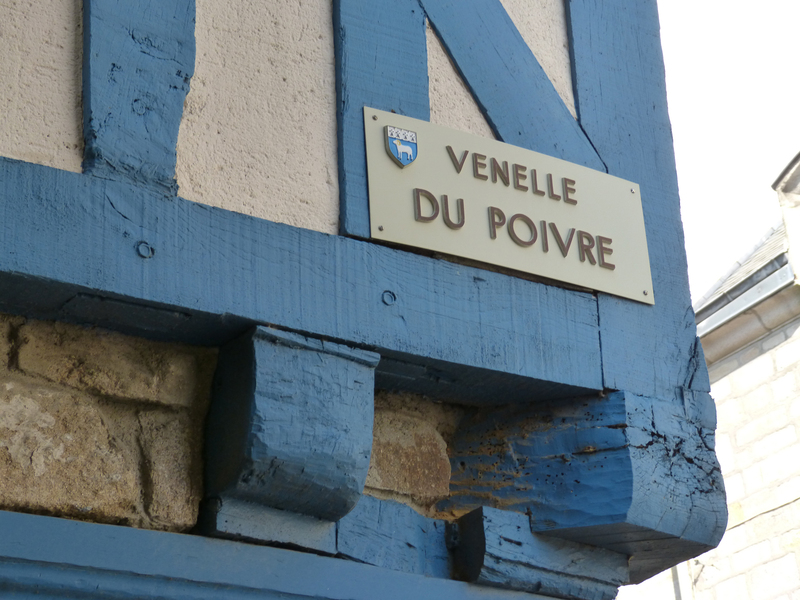 In this tiny area by the river are three (or more) potteries that have been creating the dishes that have made the name of Quimper famous around the world. There is a faience museum here but it’s closed until mid-April. I found a large store that features work by the best living painters and was able to sneak a few pictures there. It’s called Faiencerie Henriot. 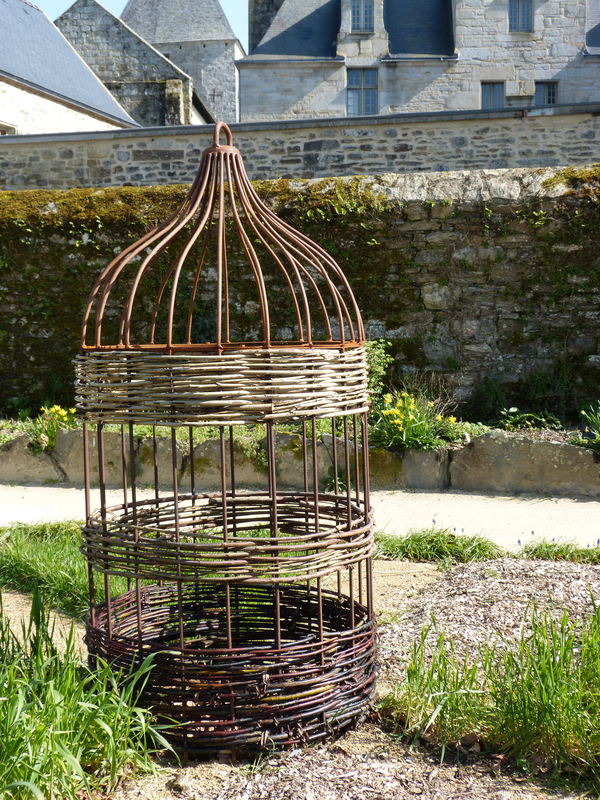 The display at the entry to Faiencerie Henriot. 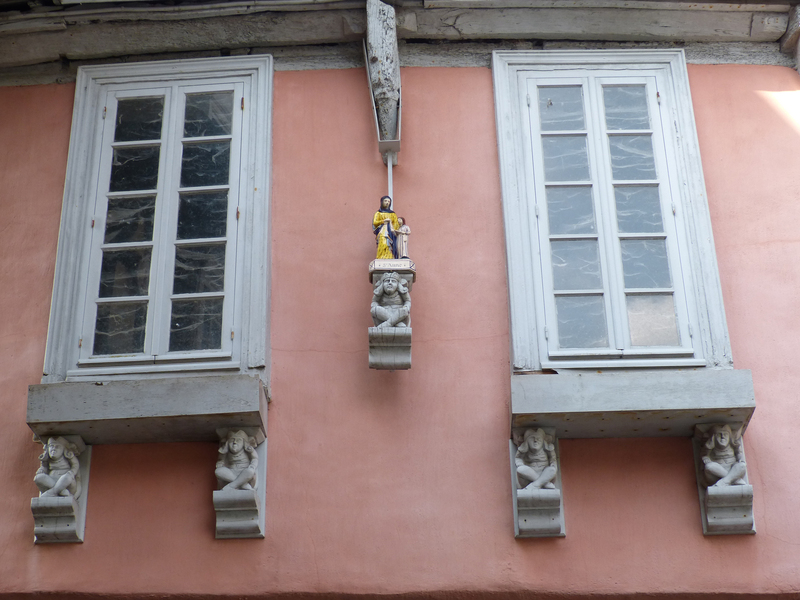 The best examples of old Quimper designs that I found, however, are on the exterior of a closed pottery. 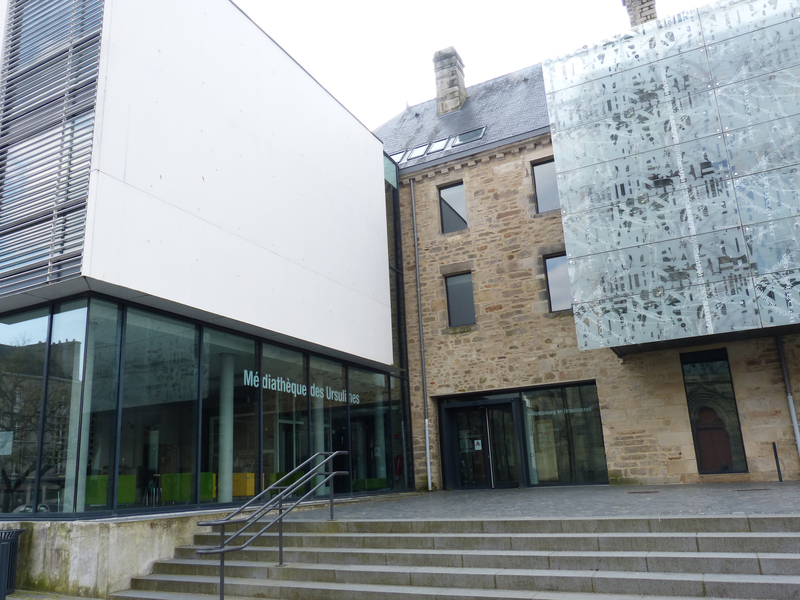 It is the former workplace of Paul Fouillen whose work is being exhibited in a 2016 display at the Musée de Faience in Quimper beginning in April. 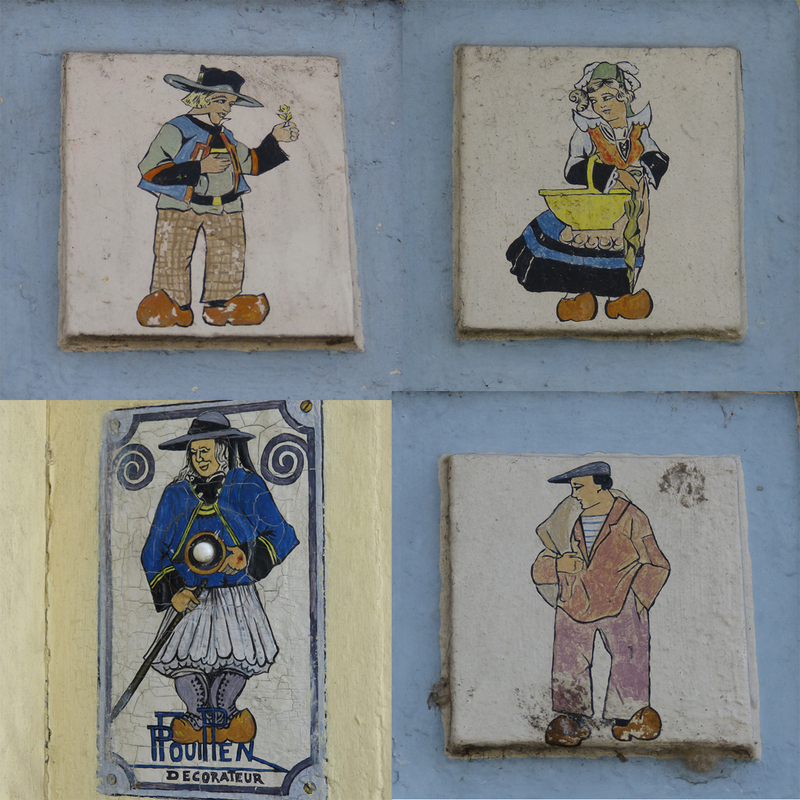 Attached to the exterior of this building as decorations are a few old tiles with original designs. Old tiles on the closed factory of Paul Fouillen. The one at the bottom left has a door bell button. I borrowed the photo of the interior of the church from this site: http://www.petit-patrimoine.com/fiche-petit-patrimoine.php?id_pp=29232_11. More pictures, much better pictures of the church than I took, can be found there. Photo at the top of this entry lifted from this site: http://www.xupes.com. 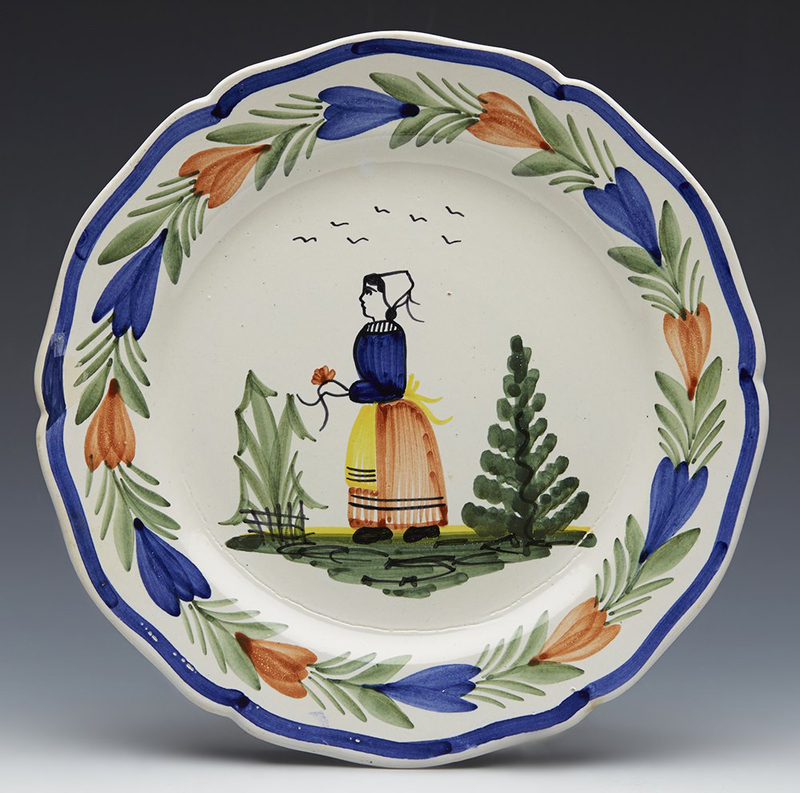 If you have an interest in acquiring Quimper dinnerware this may be a site that interests you. 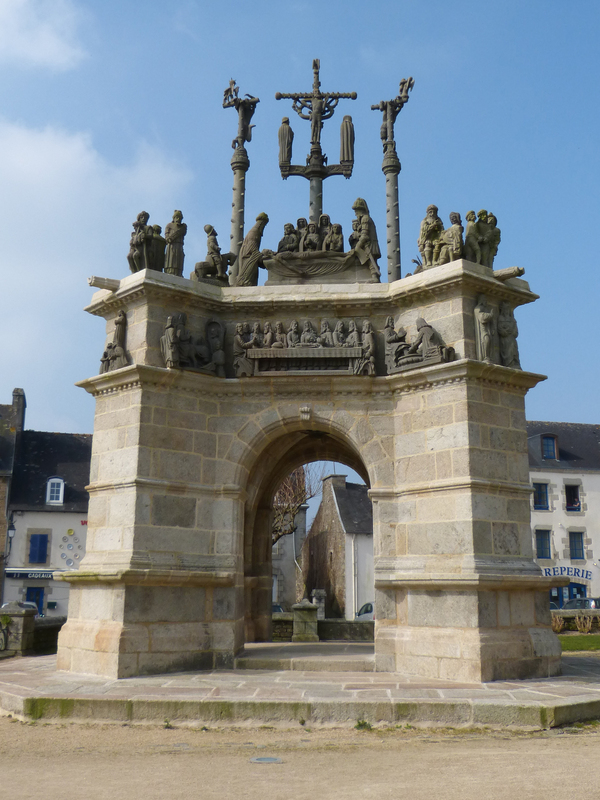 Quimper is the capital of a department (state) called Finistiere – Latin for “land’s end.” It’s been occupied since before the Romans arrived. 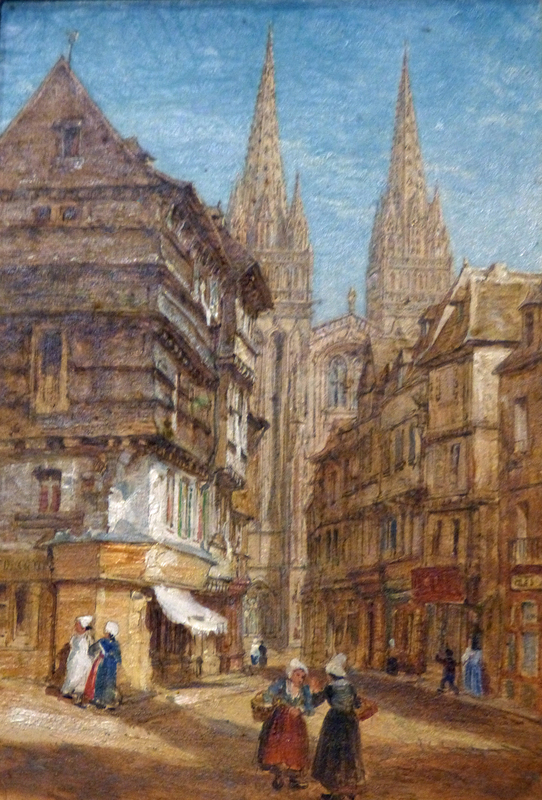 Today it’s an active city, filled with shops, restaurants and all the other services a busy, modern city requires. Join me for a short walk through this old but modern city. 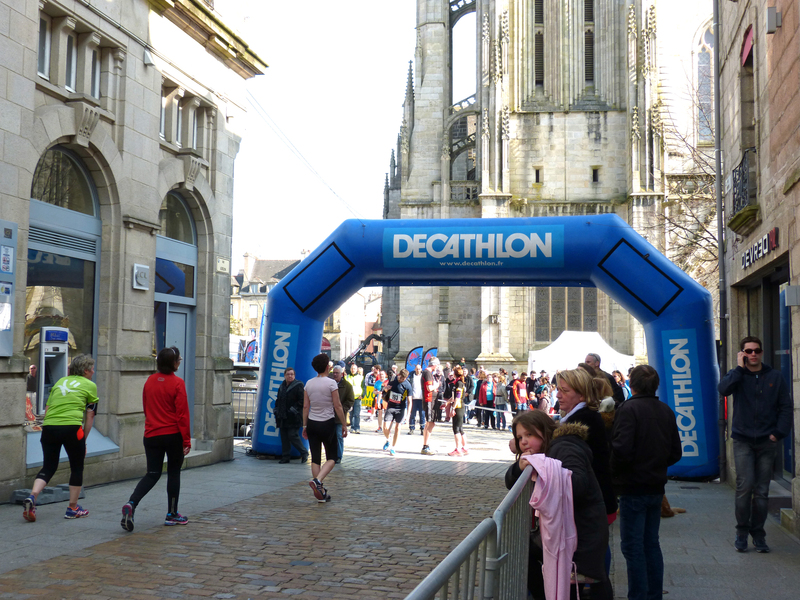 When I arrived on Sunday a decathlon for both men and women was going on, and the streets in the oldest part of town were closed to make way for the runners. Hundreds of people gathered to cheer on their friends. These women have just crossed the finish line. The town is filled with old buildings and young people. Shops fill the ground floor spaces of ancient half-timbered buildings. There are many boutiques offering fashionable clothing. 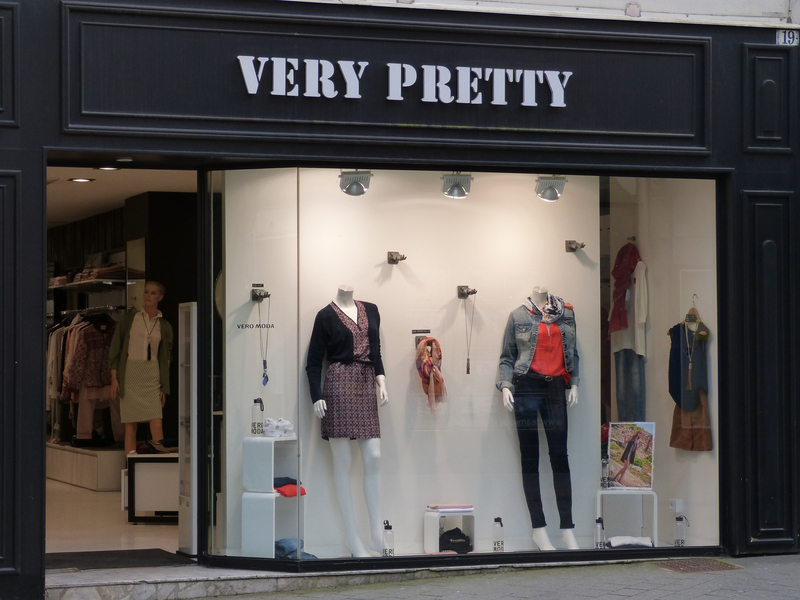 Clearly this is the place for shopping for everyone in southwestern Brittany. 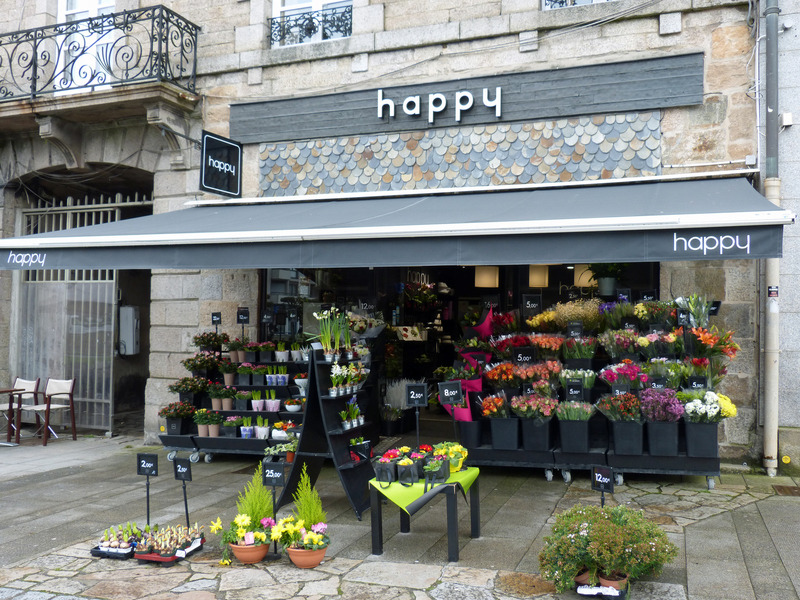 Although there are chain stores such as Monoprix and H&M, most of the businesses are small and appear to be locally owned. I’ve never seen so many shoe stores! There must be one for every 100 people. 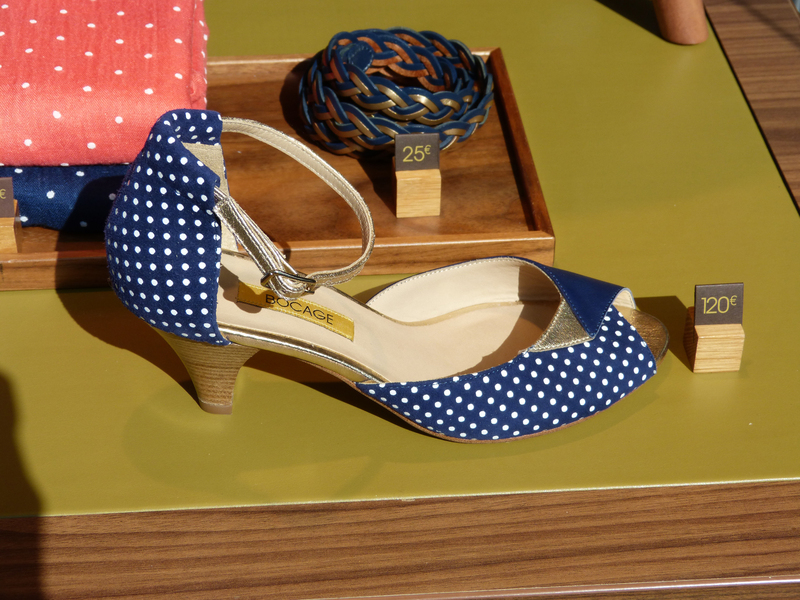 I think this shoe’s cute. Good thing she’s English speaking because she has a worse (much worse!) French accent than I have. I can’t give you French examples but trust me — often they are totally incomprehensible. The funniest thing she says though is the word “General” – as in General DeGaulle, General Patton, etc. Every town has streets named for WW2 heros. It’s an English word yet it comes out as janeiro – that is, juh-NAIR-oh. It took a full day for me to work that one out! 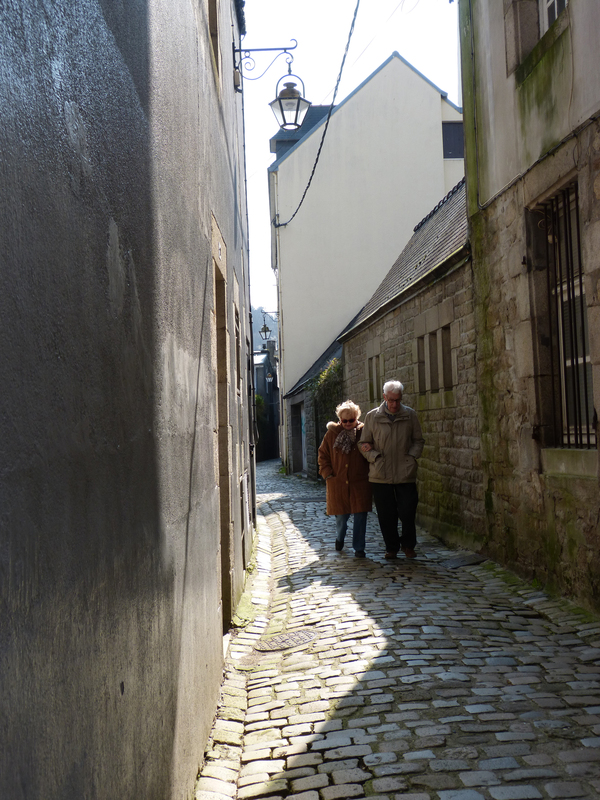 She gets me where I want to go and today we drove from the northern edge of Brittany to Quimper in the southwest. 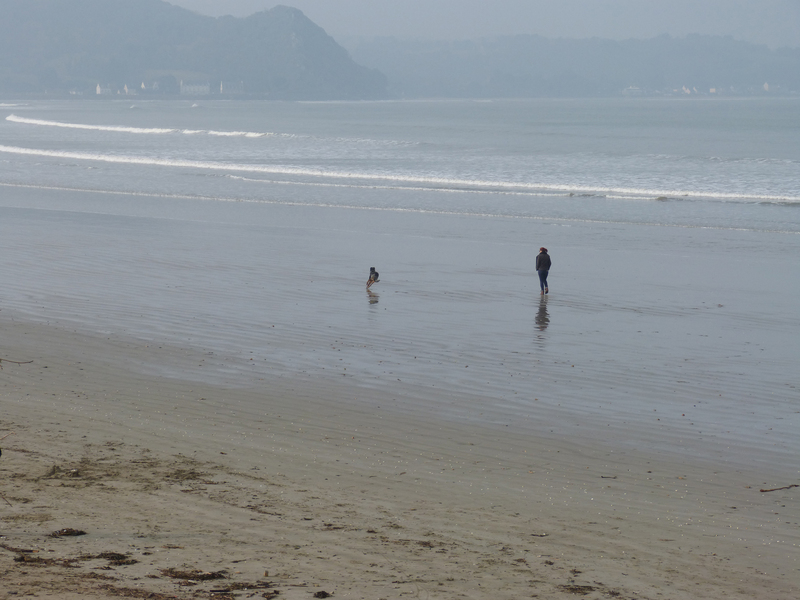 On the way we suddenly came upon a very long, very sandy beach where the tide was out 50 feet or more. I was able to take the picture above and another one for you. Notice on the right the church steeple, and how the cemetery has been built above the beach. Space is tight between the large hills and the sea. After half an hour or so we entered a national park and began climbing hills. This was strange territory indeed – even goats couldn’t survive here! Have you ever been to Denali in Alaska? If you have you’ve probably done the 9-hour tundra tour by school bus. That’s what this was like – the tundra! Brown, totally empty except for bushes that seemed like tumbleweed. Obviously it’s a park because nobody would ever want to live there! Evidently no one even wants to stop because I couldn’t find anywhere to pull over to take pictures. 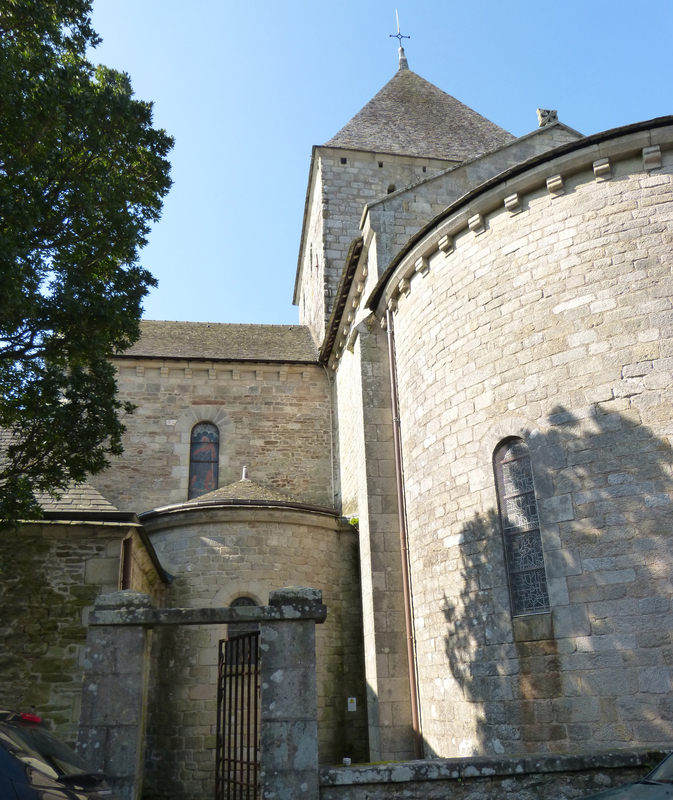 A large Breton-style church in a small city in Western Brittany called Pleyben. This is the large calvaire in front of the church at Pleyben. 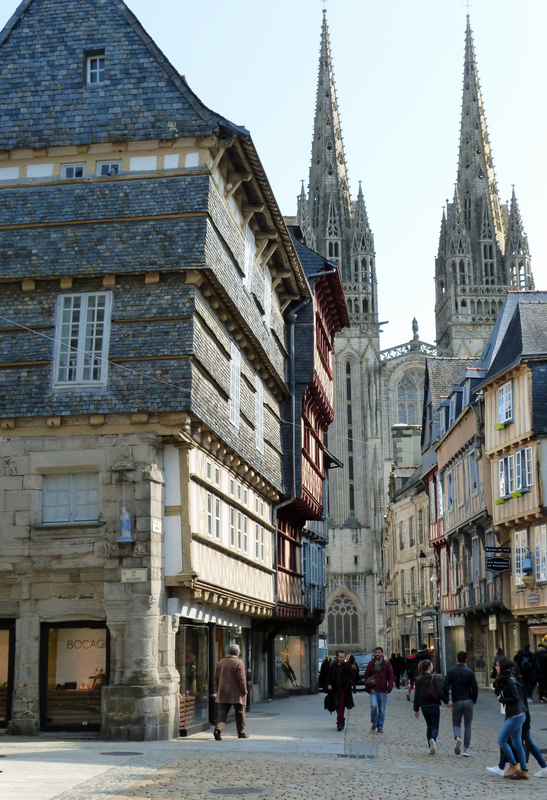 After a couple of hours total driving time I arrived in Quimper, a city I’ve wanted to visit for a long time. It’s really quite a place. It’s centered around a tall cathedral with two enormous towers. 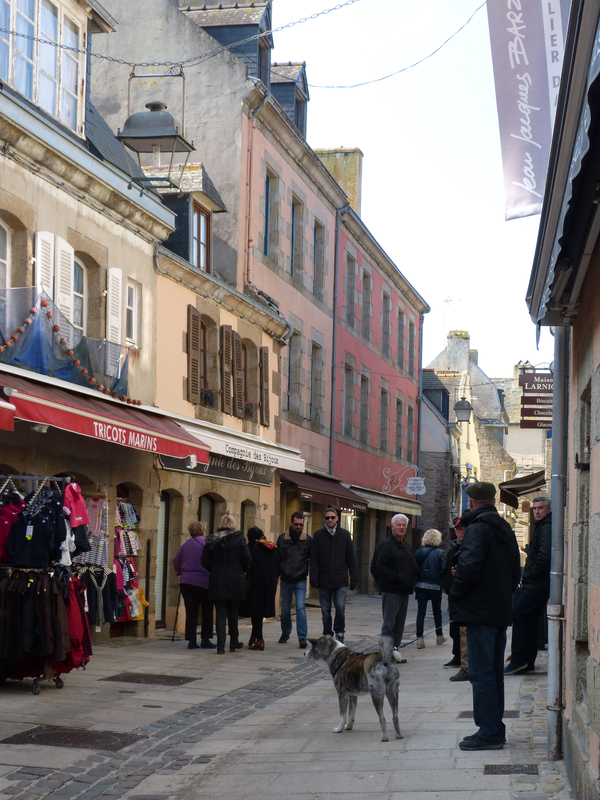 Like all the towns I’ve seen in Brittany, the center is full of medieval, half-timbered buildings, many painted in pastels or bright colors and all of them hosting shops with the latest fashions or high-tech gadgetry. This is really going to be a fun place to spend the next eight days! And when I get lost, my new best friend is in my pocket, telling me how to walk from where I am to where I want to be. P.S. Had some trouble getting on the internet last night and this morning but the problem is solved now. This post was actually written yesterday, Sunday March 13 2016. 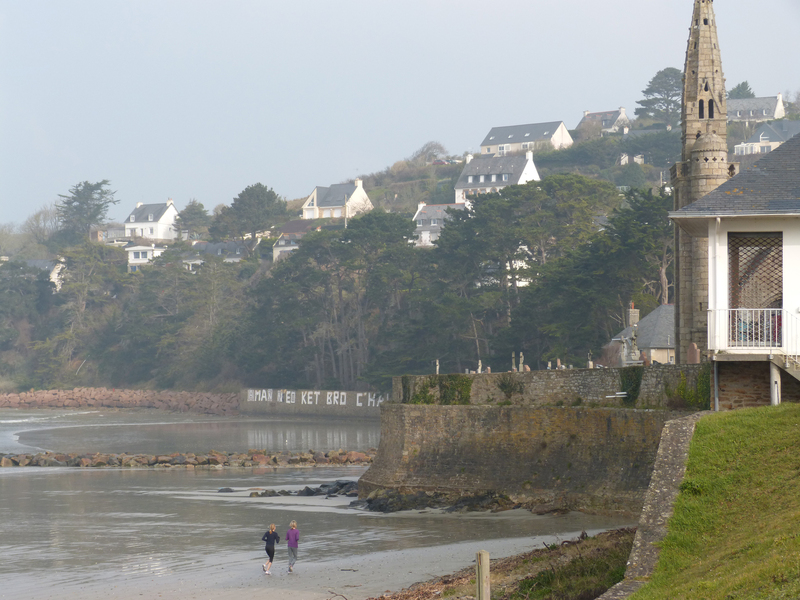 Today I drove farther west in Brittany and closer to the famous Cote de Granit Rose (Pink Granite Coast). This country is much like Ireland, with very green rolling hills with gorse bushes growing wildly. If you haven’t been to Ireland you may not know “gorse.” It’s an ugly yellow-flowered bush with very hard foliage that makes up the famous hedge rows of Ireland. Here the pastures and fields are large and open, unlike those in Ireland that were divided into small plots for the tenants of the landowner. 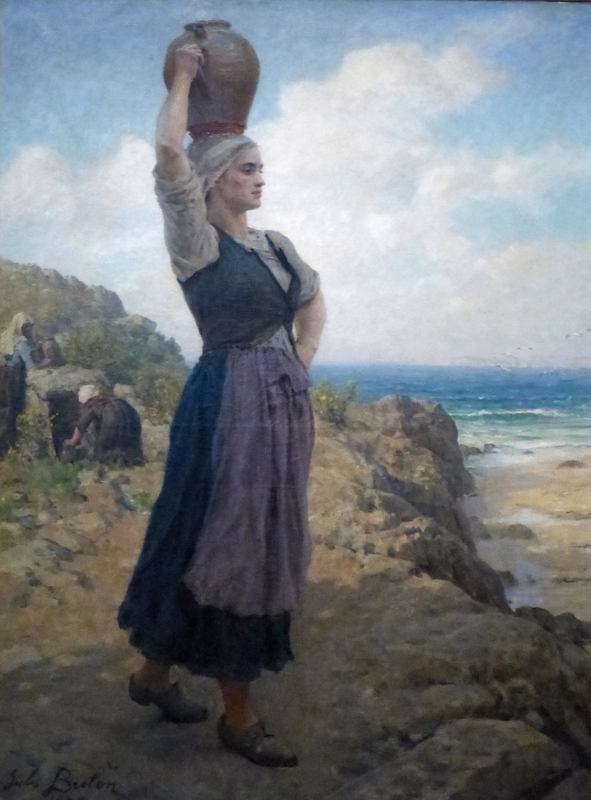 That makes me wonder whether Brittany had a serf-based economy in the middle ages as much of Europe did. This was an independent country at that time that did things the Celtic way. That’s a question I should try to find an answer for. The most interesting place I saw today was a 14th-15th century cathedral in a small city named Teguier. This is a classic French gothic cathedral, a bit smaller than most. It lost its bishop – and therefore stopped being a cathedral – in 1801. 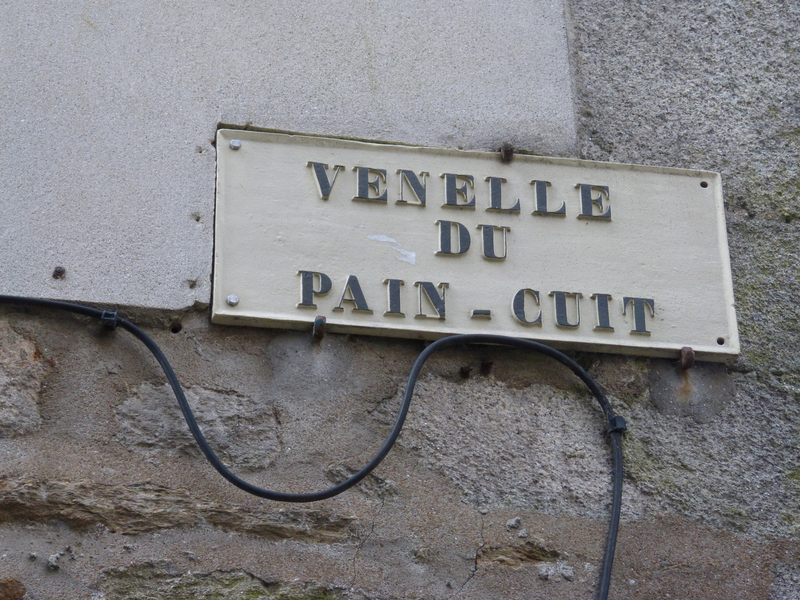 Frankly, there’s not much about its history to be found on the internet or in my Brittany guide book. A 12th century tower in the north transept is the only remnant of an older cathedral. Two other towers, one over the crossing and one over the south transept are rather short except that the southern tower has a magnicent steeple 63 meters (nearly 200’) tall. A beautiful cloister is somewhat hidden on the north side of the choir. The cathedral is surrounded by well-maintained medieval buildings. 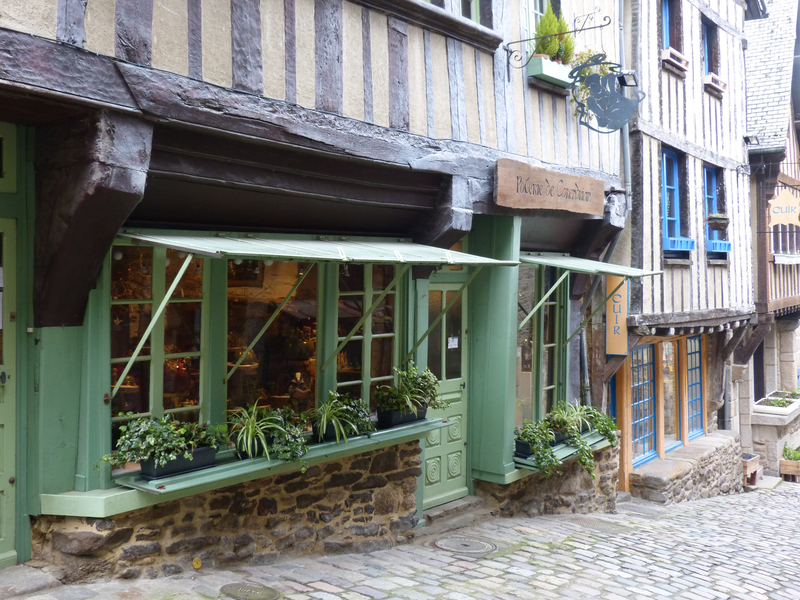 I’m beginning to think every city and town in Brittany has a heart of 500 year old buildings. 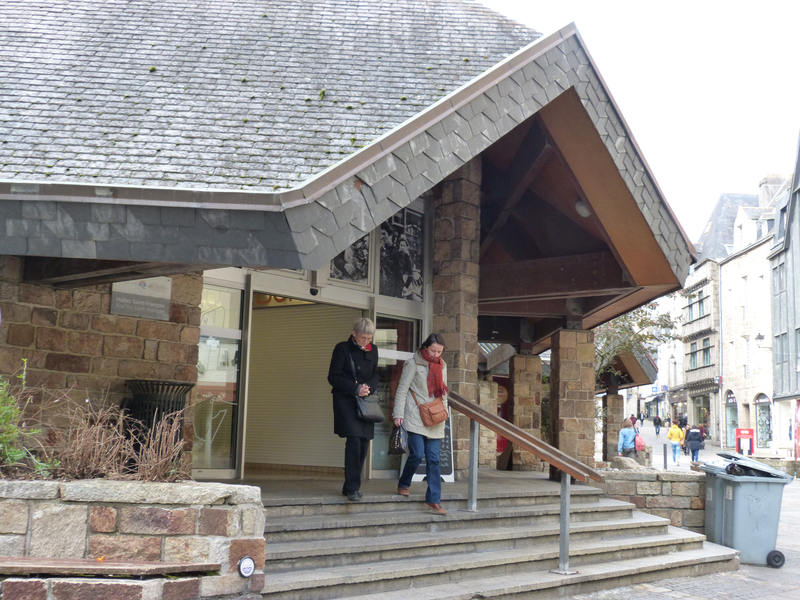 The town also has a full complement of granite buildings. This is the granite coast, after all! In the countryside there are big stone farm houses all along the roads. They remind me of the beautiful stone homes in the country around Philadelphia. Attached to them are stone barns rather like the farms of Maine with the “big house, little house, chicken house, barn” all attached to one another. In Maine those houses are made of wood – here everything is stone and must have taken a long time to build. Now and then a small house, often with white stucco over the stones and likely covered originally in thatched roofs, appears by the side of the road. 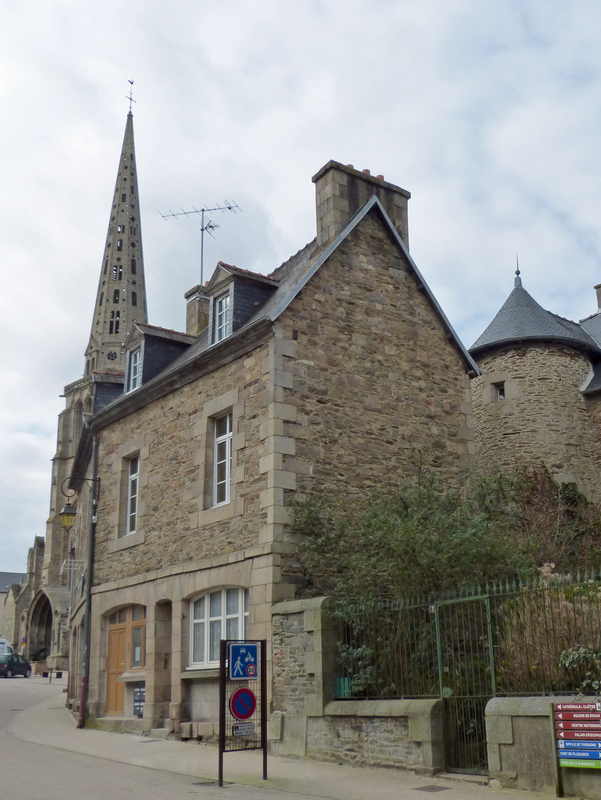 This view of a house in the town with a tower next to the cathedral (showing its steeple) demonstrates the universal use of granite stone here. 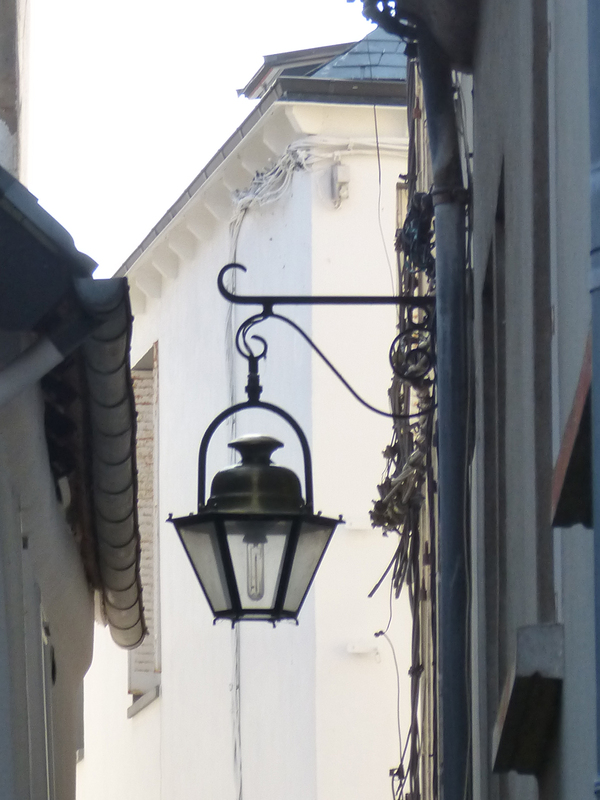 A line of shops that have been holding one another up for centuries. 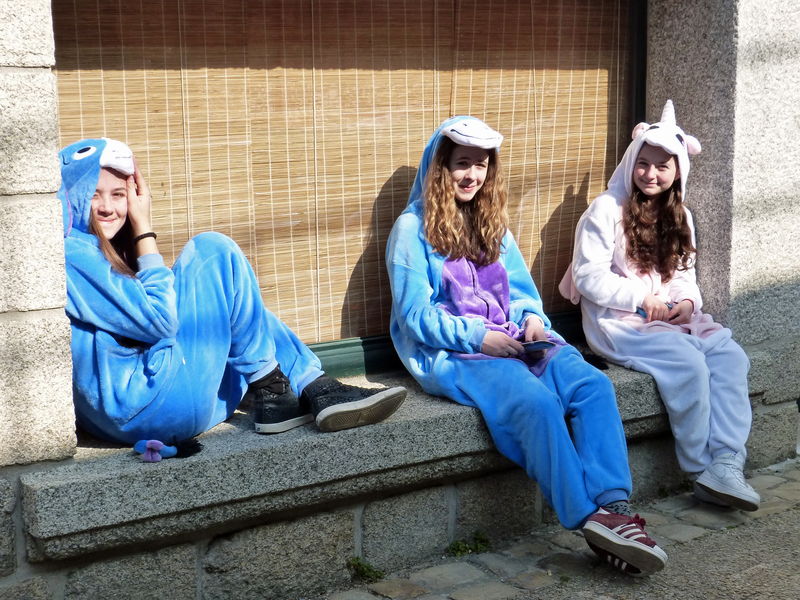 in the cathedral square of Treguier. 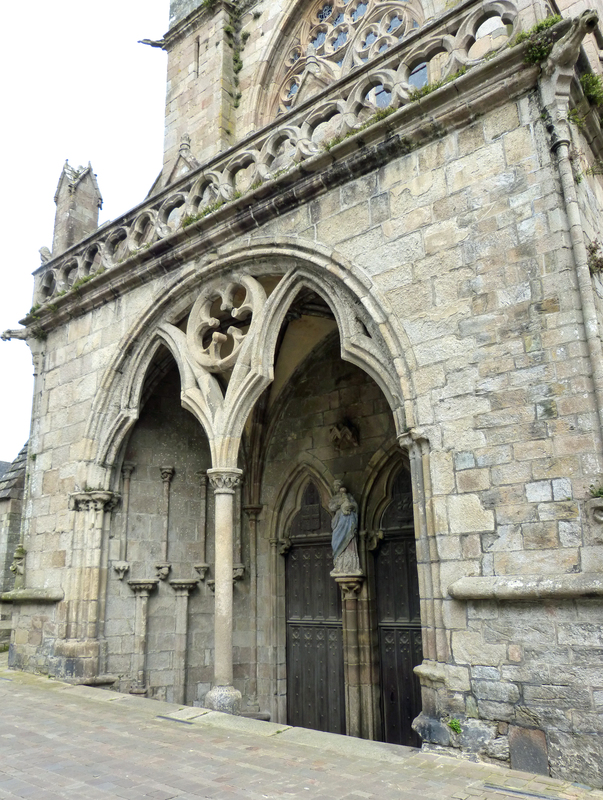 This is the western door and porch of the Treguier cathedral. Normally cathedrals are entered on the western side but here it seems the south side is used. This is a dark and unwelcoming portal, probably seldom opened. The style is renaissance. There’s a dirty, worn out statue of Mary and her baby visible between the doors. This is the interior of the eastern end of the church, over and behind the altar. Note the beautiful painting on the ceiling. The glass in in the center didn’t show well in my photo but all three windows are stained glass. I’ve found no information about the age of the glass. This is the southern side aisle. 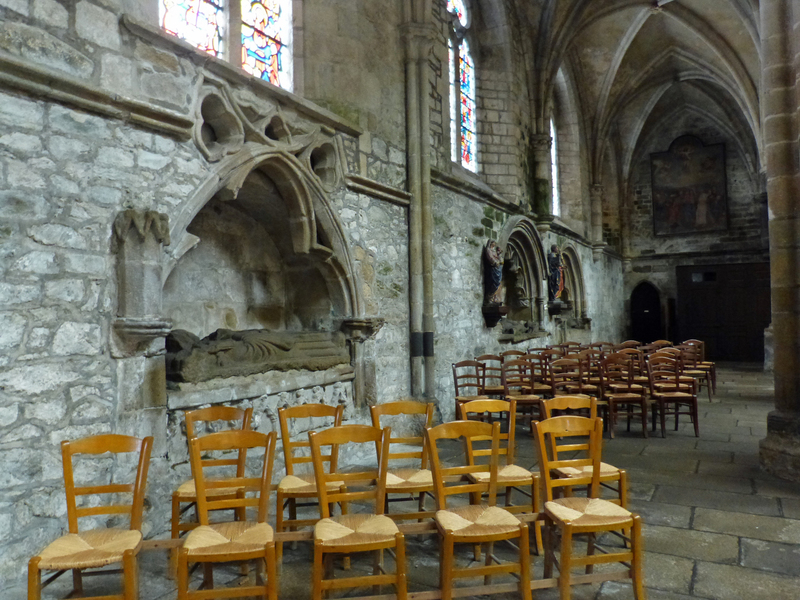 The French use chairs like these instead of pews in their churches. The three openings in the wall are tombs. The French have been building strong, beautiful, impressive buildings for more than a thousand years, as have all European people. They discovered how to build gothic cathedrals that continue to amaze us. For centuries they have preserved those buildings and their history. I am always astonished when I find a town center filled with houses built 400 or 500 years ago. The old oak beams may sag, but they don’t give way. People continue to live in these ancient buildings and to locate their small businesses in them. Town fathers and mothers pass laws to protect their heritage and children grow up understanding the importance of their country’s history. 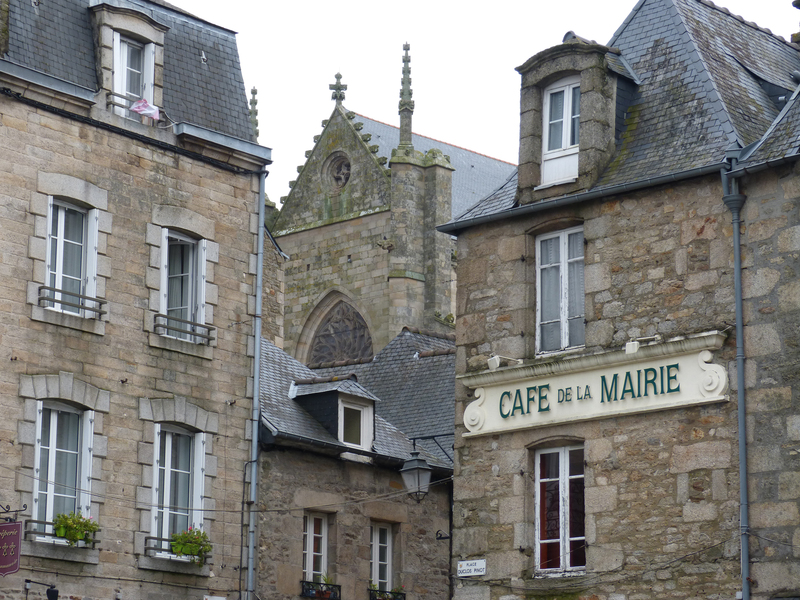 Today I found such a town: Dinan, France. 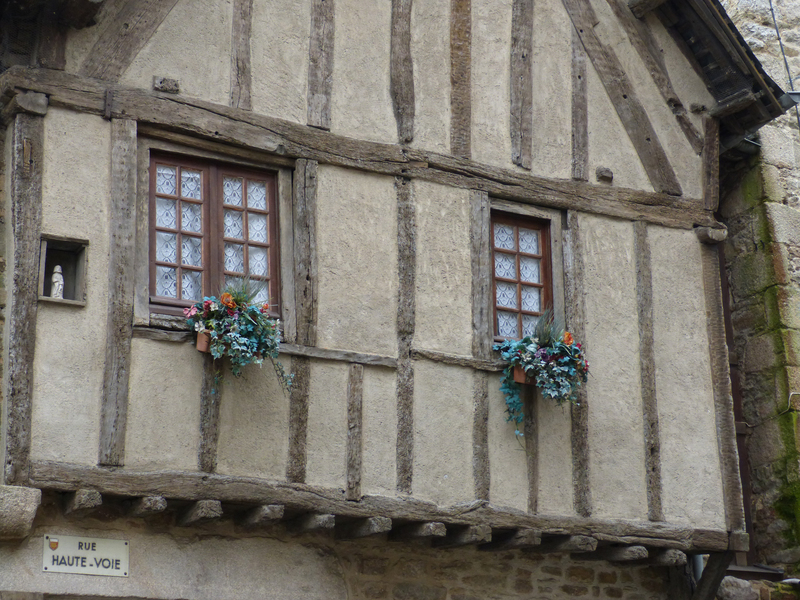 There are blocks of medieval half-timbered buildings (the French word for those houses is “columbage”). 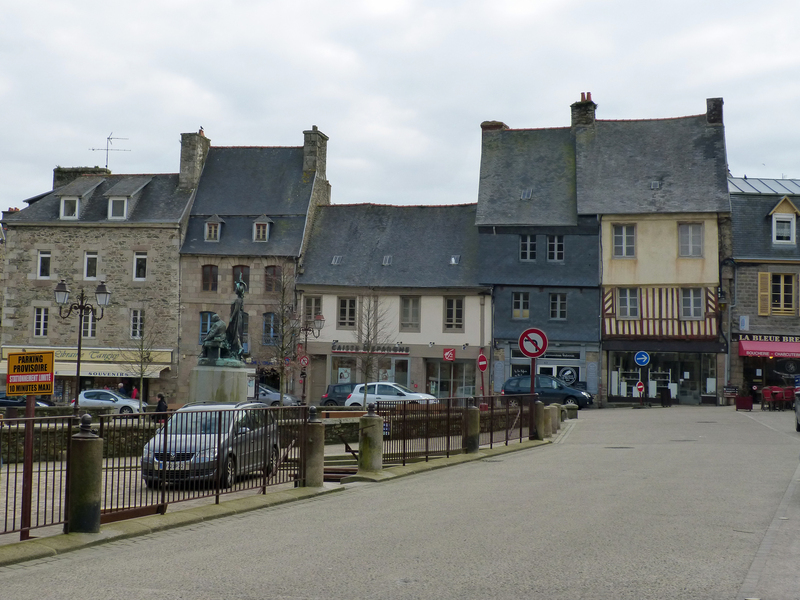 And around them, looking practically modern by comparison, is a town of stone buildings from the 18th and early 19th centuries. 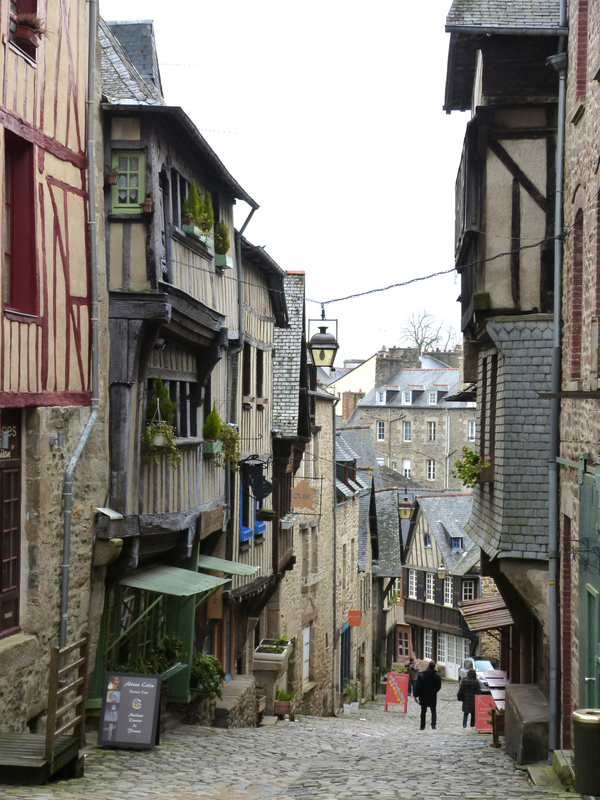 Dinan is a Rick Steves favorite which is how I discovered it. 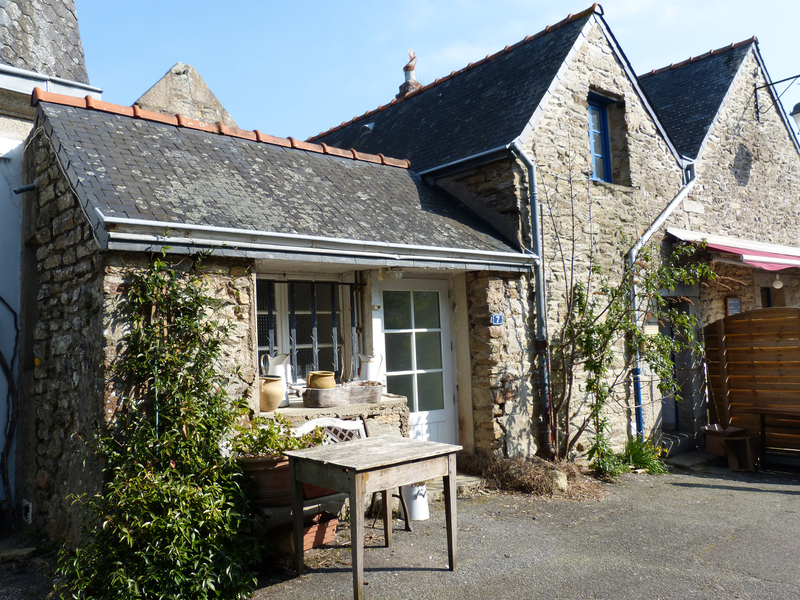 It’s located 20 or 25 miles from St. Malo, inland and on a river. It’s a busy, active city. There are many appealing small shops and restaurants with a cosmopolitan flair (I had Indian food for lunch). The medieval town is inside intact town walls and covers a large area. 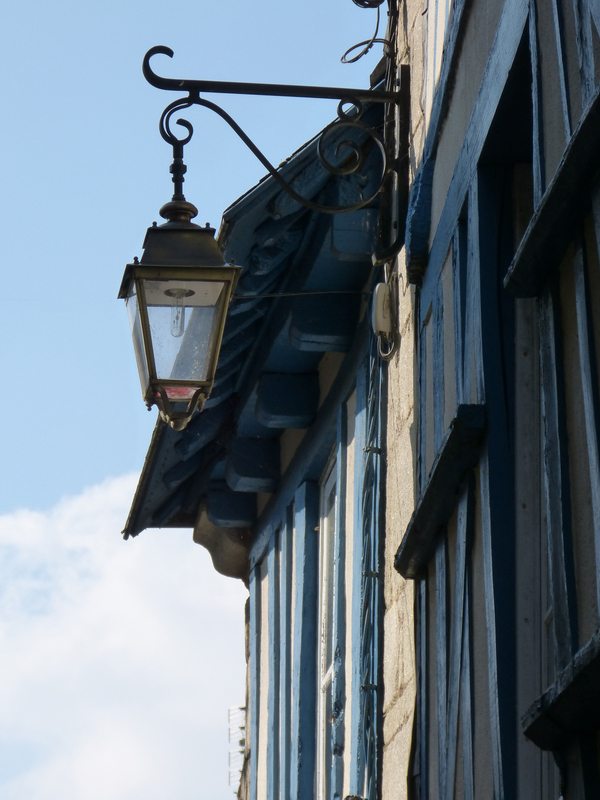 As we all know, pictures are better than words, so here are some images I collected while wandering around Dinan earlier today. 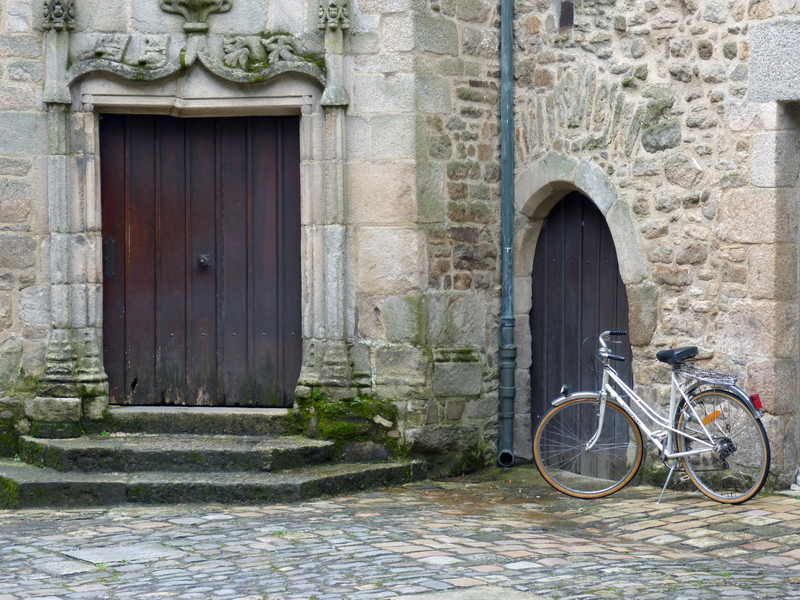 A classic view of old French buildings in Dinan. The “Mairie” is a word for city hall, which is just across the street and out of camera view. 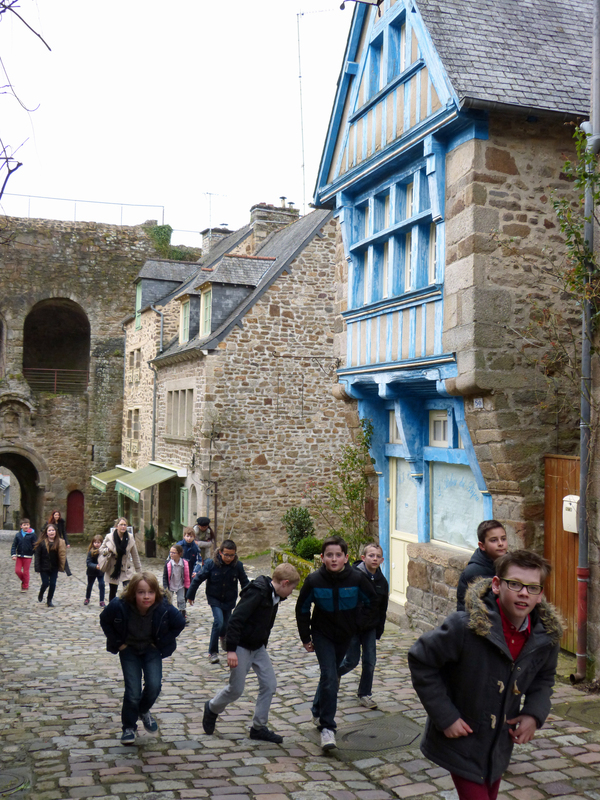 A saw lots of school children entering the town theatre this morning, and then passed these guys returning to school just before lunch. Note the old city wall on the left. Surely growing up in a place with so much history must leave an imprint on the children. 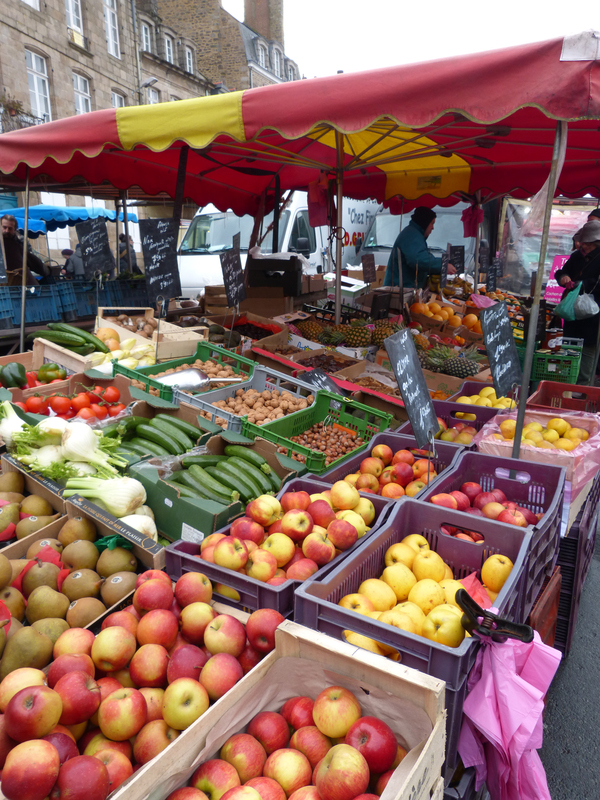 I was lucky to be in Dinan on market day. One thing I noticed: apples! Brittany in next to Normandy which is famous for its apples. I guess Brittany should be famous too. 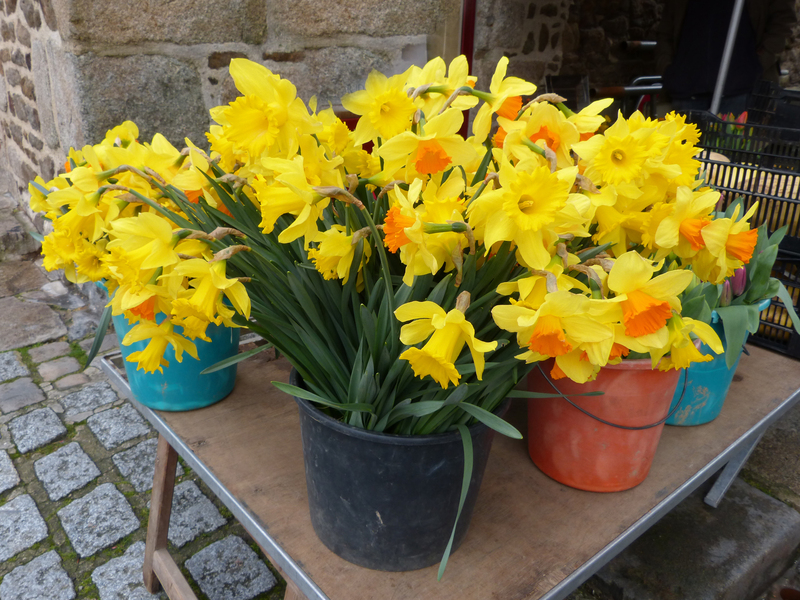 A man at the market was selling buckets of Springtime! This street, which runs down to the river and to a gate in the old city walls is lined with medieval buildings. 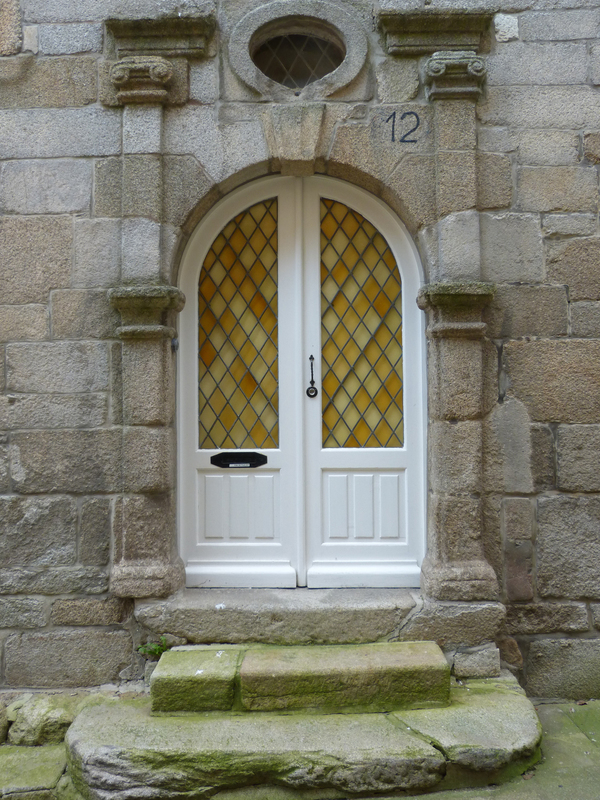 There’s a beautiful renaissance era mansion in Dinan called Hotel Kératry. Construction began on it in 1559. Here’s a view of the door in the tower. Hotel doesn’t mean what we think of– it’s a term used to label a very large mansion. The flowers are plastic but everything else is real in this charming old house. 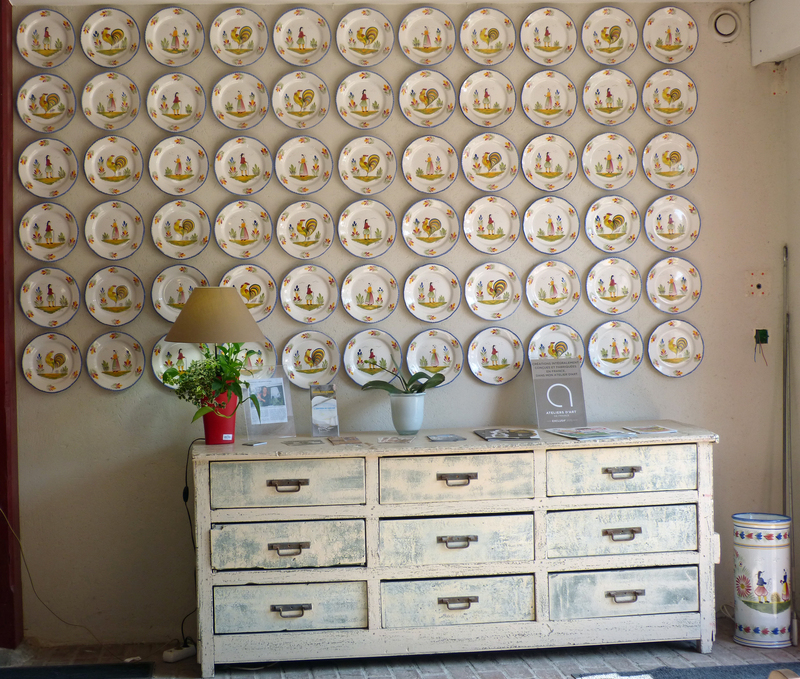 One of many fine shops in the town — this one sells pottery. 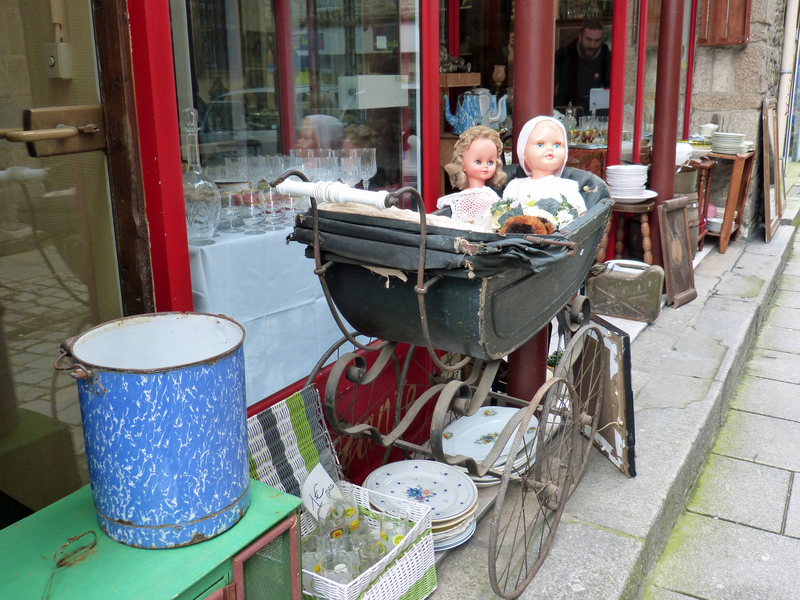 A down-market antique shop in France is called a “brocante.” This one was calling my name but I escaped! 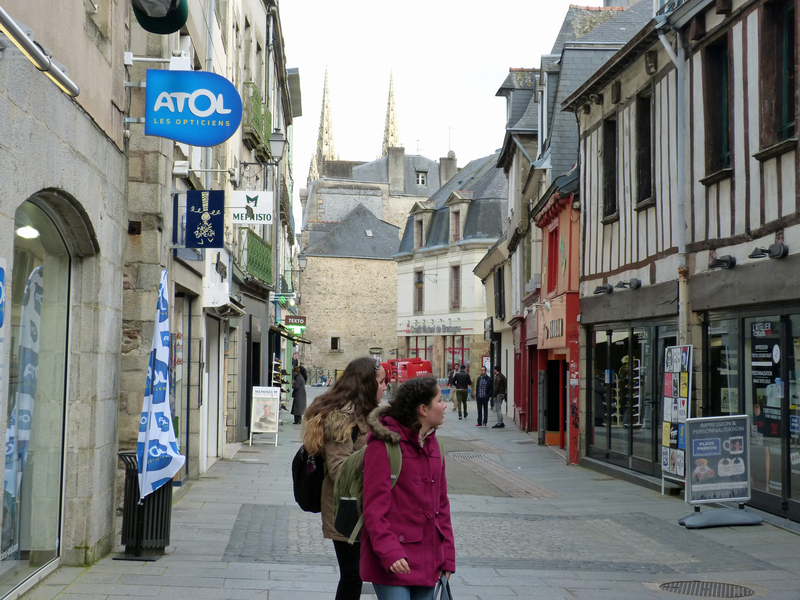 The sky was pretty gray this morning when I was taking pictures in Dinan but the sun came out around 4:00 so I went to St. Malo’s old town, hoping for sunset pictures from the top of the wall that surrounds the town. Unfortunately, the clouds rolled in just as I did and it was clear there’d be no sunset tonight. Several of you have written to me about the book All the Light We Cannot See by Anthony Doerr which I read in January and recommend. 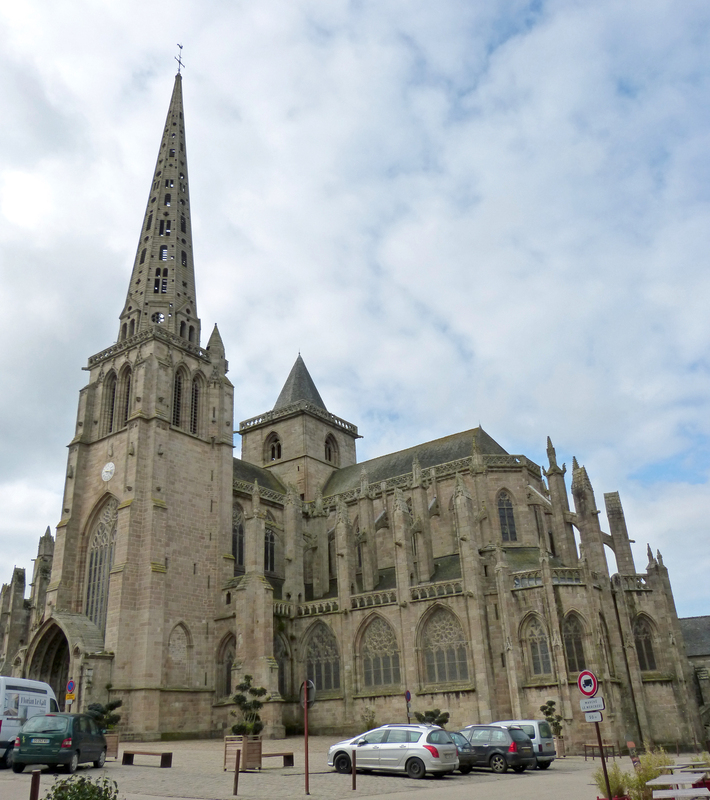 Although I’ve been there it was only in reading that book that I learned that St. Malo was almost completely destroyed by American bombs in the effort to drive the Germans out of town following the Normandy invasion. The city inside the walls that we see today was rebuilt after World War 2. The walls that surround the city are wide and run along the shoreline, holding back the English Channel and providing a fine walk with a view over the city. Here are a couple of photos I took a few years ago. 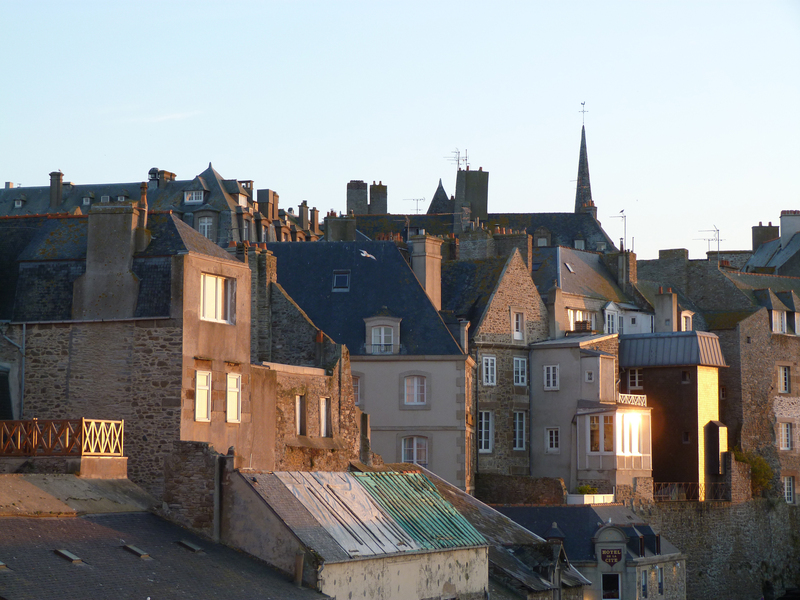 A sunset view of Saint Malo from the top of the city walls. 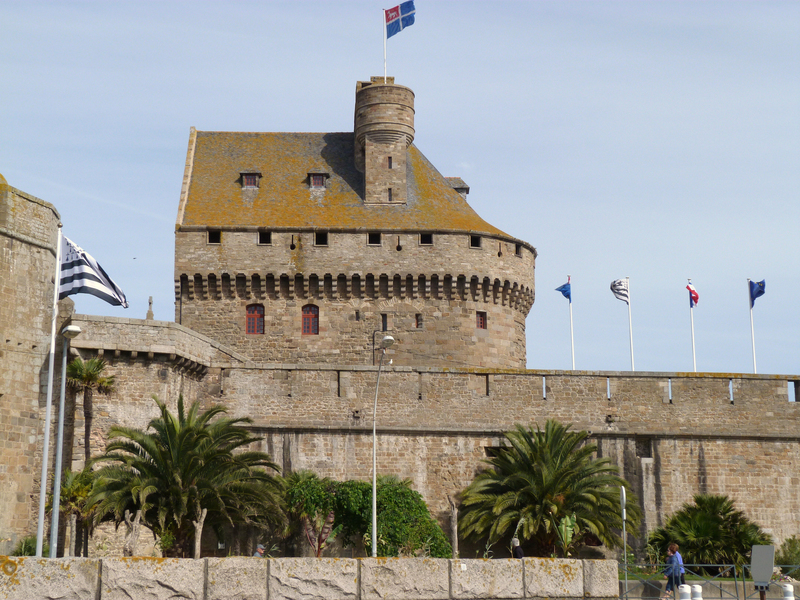 The chateau/fortress in Saint Malo.